Driving along the California Pacific Coast Highway (PCH) is perhaps one of the greatest road trips in the world. Over the past five years, I was very lucky to have the opportunity to visit many of the towns and city’s along the Golden Coast. But it was not until this past summer that we did the full road trip from San Francisco to Los Angeles following Highway 1 coastal route from top to bottom. Along this famous route, you’ll drive through big metropolitan cities and tiny coastal towns, gliding by redwood forests, classic California beach towns, lighthouses, major wine regions, marine wildlife, Spanish colonial sights, outdoor adventure opportunities, state parks, and even Hearst Castle. Not to mention the wonderful scenic views that will have you pulling off for impromptu ogling and photo ops all along the Pacific Coast Highway! We’ll share some information to get you started in planning your own California Pacific Coast Highway road trip and share our favorite 15 places to stop along the way and tips for what to do and see in each place. What is the difference between the Pacific Coast Highway and CA State Highway 1? How Long do I Need to Drive the Pacific Coast Highway? When to do the Pacific Coast Highway Road Trip? Choosing Transportation for Driving Highway 1? South to North or North to South Route? What Should I Do in Advance of Driving the Pacific Coast Highway? Here are some frequently asked questions that can help you plan your own California Pacific Coast Highway road trip, from when to go to, what to pack, and where to find helpful web resources. If you drive along the coast following the highway from Los Angeles to San Francisco, you’ll encounter roads with signs called CA State Highway 1, Pacific Coast Highway (PCH), Cabrillo Highway and Shoreline Highway, not to mention at times you’ll have to join the U.S 101. According to Wikipedia, the CA Highway 1 runs about 655 miles (1,055 km) from near Dana Point in the south to near Leggett, CA in the north, and only two middle sections have been officially denoted as scenic byways, the Big Sur Coast Highway and the San Luis Obispo North Coast Byway. If you go from the southern point of CA to the northern, you’ll lose CA State Highway 1 all together at both ends. The Pacific Coast Highway, I believe, is technically only about a 130 mile segment of Highway 1 that runs from Dana Point to Oxnard in southern California. The terms Pacific Coast Highway and Coast Highway are sometimes used to refer to a route from the southern coastal point of California that extends all the way to Canada or even beyond. Basically, I would not worry about all these technical designations which often don’t matter much and don’t align well with travel articles or traveler reports, but you should know that you may see different names on signs along your route and at times you will have to leave the coast and/or join U.S. 101. Just use your map and/or GPS to keep on your designated route and head to the places you want to visit without being too concerned about the technical designations of the highway. This will entirely depend on how much time you have and what you want to do and see along the way. Note that distances in California can be quite greater than what many people are used to and things move more slowly on CA Highway 1 which has lower speed limits than on the main interstate highways. Traffic on this route can be particularly slow if it is crowded or bad weather conditions. Getting into and out of Los Angeles and San Francisco can take much longer than anticipated depending on traffic conditions so allow extra time in these areas. You can actually drive straight from Los Angeles to San Francisco in a day, but we recommend spending at least 4 or 5 days to explore some of the places in between. 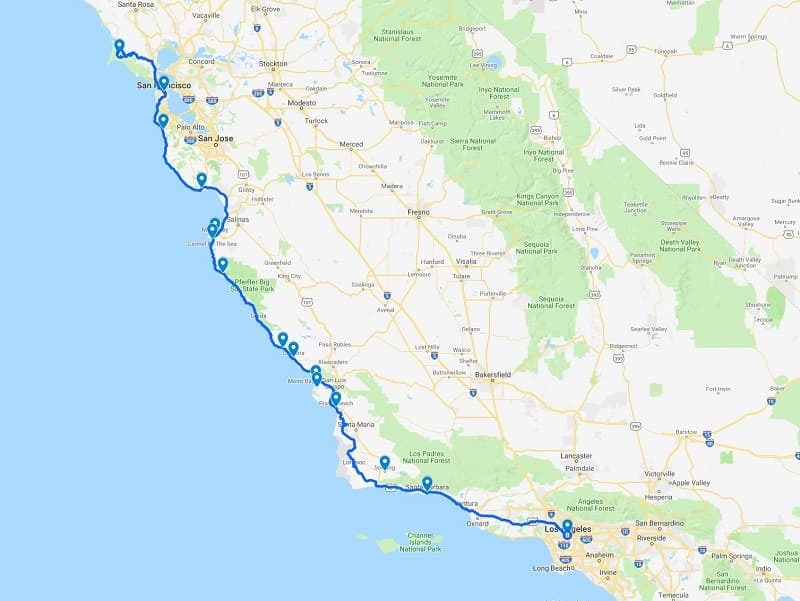 Ideally, I would set aside at least 2 weeks to do the route with 3 to 4 days in Los Angeles, a week for the towns between Los Angeles and San Francisco, and 3 to 4 days in San Francisco. If you want to drive all the way from the north of California to the south, I’d add at least another 3 days. Basically, the more time you can spare, the more you’ll get to better explore all these places. Be sure to check road conditions before you go as you may need to allow for road construction and/or detours. Given the temperate climate along the coast, most times of the year will work for this road trip. In the southern part of the state (San Diego to Los Angeles), you’ll find sun fairly year round. Summer guarantees more warmth and sun in the south, but you might find foggy weather along the Central Coast and San Francisco Bay area. The largest crowds will also be traveling this route from mid-June to the end of August. October tends to bring the nicest and least rainy weather to the San Francisco Bay area, and September can also be quite nice. Note that even in summer, you might find it cold along the Central and Northern Coast, especially places like Half Moon Bay, San Francisco, and further north. No matter when you go, just be prepared so inclement weather doesn’t stop your sightseeing, bring clothing you can layer, jackets, and rain gear. Also don’t forget your sunglasses and sunscreen; wear sunscreen even if you plan to stay in the vehicle most of the day as you can still get sun damage from UVA rays! It wouldn’t be a road trip unless you are driving, so either you’ll need to supply your own vehicle or motorcycle or you’ll need to rent one. If you are planning on renting, you should consider whether you want to stay in lodging along the way, bring camping gear to set up a tent at campsites along the way, or if you want to be able to sleep in your vehicle such as with a campervan or RV. There are a lot of major rental car (Thrifty, Hertz, Alamo, Avis, Dollar, Enterprise, etc.) and RV companies that have offices in California (mostly in major cities) so check around and compare prices. Just be aware that some firms charge one-way fees – in our experience, Enterprise usually offers the best value for this type of rental. If your dream is to drive a convertible or classic car along the coast, you can do this but just know that it will be quite expensive and you might be better off saving the money for some fun experiences along the route. For this specific road trip, you’ll probably want to look for companies that allow you to rent a vehicle at one end of your journey (e.g., Los Angeles) and return it at the other (e.g., San Francisco). Be sure to specifically check on any one-way drop-off fees which can add an additional $100 or more to a rental car price. To rent a vehicle or RV, you typically need to be at least 21 years of age (often 25 years of age) and have a valid driver’s license. If you are not an American citizen you may need to obtain an International Driving Permit from your home country or an authorized English translation of your driving credentials. If your driver’s license is not in English and you plan to be driving in the U.S. for a week or more, it is a good idea to get an International Driving permit or English translation even if not required by law or the rental agency as it is helpful to have one in the event police pull you over and ask for your license. If you are an international driver and have never driven in the U.S., you should check out this article from Laurence about tips for driving in the U.S. for British drivers (or any non-U.S. driver). 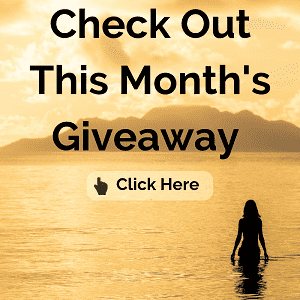 We chose to do a month-long USA roadtrip in a JUCY campervan rental, and JUCY conveniently has offices located in San Francisco, Los Angeles, and Las Vegas which are primary West Coast road trip hubs. Hiring a campervan gave us the option to sleep and eat (there is a small kitchen included!) in the RV, and this helped us save a lot of time and money along the way. 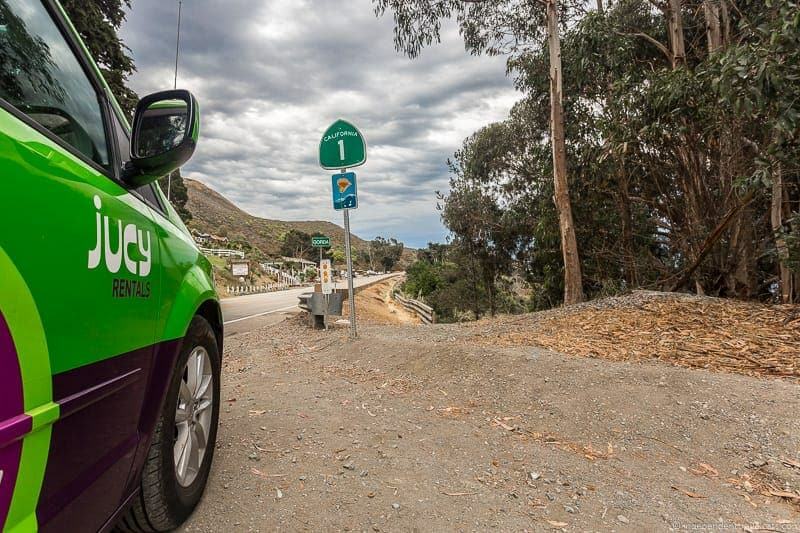 If driving along in a bright green and purple campervan with a pop-up Penthouse on top doesn’t sound intimidating, you can read a full review of our JUCY campervan experience written by Laurence on his blog. I would not put a lot of thought into whether the trip is best done south to north or vice versa. It makes little difference although there is a small argument in favor of north to south as you’ll be closer to the coast and most of the rest stops and pull overs are on this side of the road. Others have told me that there are better views going to south to north, but having done the drive myself, I have doubts about there being too much superiority in either direction. I would base this decision on your logistical needs (e.g., where you are based, best flight deals) and things you want to see along the way (e.g., a festival in San Francisco you want to be at on X day). I would decide on your general route, make your car or RV reservation in advance (if needed), acquire a good map, road atlas, and/or GPS, consider buying a good California guidebook, check opening days/times for any must-see sites, and book tickets to any major concerts, performances, or sporting events as these can sell out months in advance. For major sites like Alcatraz and Hearst Castle, it can be wise to book tickets at least a few days in advance if you know when you’ll arrive as they sometimes sell out on certain days, especially during the summer. If you want to attend (or avoid) any festivals, plan ahead so you can be sure to be in the area during the event or to skip it to avoid crowds, traffic jams, and higher hotel rates. It really depends on how you like to travel if you want to make reservations for your lodging ahead of time or wait to see where you are each day to decide. I would recommend making reservations for accommodations in Los Angeles and San Francisco in advance as well as any lodging or camping reservations in Big Sur (or arrive early for first-come, first served sites) as there is a limited amount of availability in that area. If you are on a budget, it can be wise to make sure you get camping sites, Airbnb apartments (get up money off your first AirBnB booking with this link! ), budget motels, etc. booked in advance so you don’t end up spending more than you want on lodging. If you are wanting speciality lodging such as a bed-and-breakfast, a lighthouse stay (Pigeon Point and Point Montara Lighthouse Hostels), or a boutique hotel, I would also book these in advance as they can be booked full weeks in advance even outside of the summer months. Also, you may want to make a good California road trip music playlist or CD before your trip! For state park campsites in California check out the camping section of the CA Parks website. Here is a searchable list of camping and RV sites that are part of the California Association of RV Parks and Campgrounds. Note that free primitive camping (no hook-ups) is available on many public lands administered by the BLM (Bureau of Land Management) and the USFS (US Forest Service) as well as some other organizations or even private ranches. Some WalMart stores also offer free overnight parking although we found that there were few that did so along the California coast. CA rests areas allow up to 8-hour parking but do not allow camping, pitching tents, and don’t recommend overnight parking. Los Padres National Forest is a very largest forest recreational area that has a number of campgrounds along the route (both free and paid but most are primitive or offer few facilitities). There are plenty of accommodation options all along the Pacific Coast Highway, which include motels, campsites, B&Bs, hotels, and luxury resorts. There are also fun and quirky places like lighthouses, yurts, and cabins where you can spend the night. We have included a few of our favorites throughout the post below. For booking, we recommend personally often use booking.com which we find usually has the best prices when we travel and we also like reading the reviews before we book. Take a look at their California listings to get started. I am only going to discuss my favorite 15 recommended stops, but here is a list of potential worthwhile stops (in order) from north to south that goes all the way from the northern coast to the southern coast that are major places you might include on a Pacific Coast Highway road trip itinerary. Most people are primarily interested in only the section between San Francisco and Los Angeles, but I wanted to include this to give people an idea of where these cities lie in relation to each other and to give ideas for those who may be interested in heading south of LA or north of San Francisco. I’d recommend venturing north of San Francisco for those who want to see more of the redwoods and for those who want to escape the crowds a bit and see parts of the coast that are not as touristed. I’d recommend heading south of Los Angeles for those interested in famous beach towns and for those interested in visiting sunny San Diego. I’ve included a few places slightly off of Highway 1 such as San Jose and Solvang, but none that would require more than an hour’s drive. Detours to places like Yosemite National Park and Napa Valley are not included on this list but are possible to also include in your itinerary; just note you may have to make significant detours and may miss portions of the route. Note, that all the towns with asterisks above are the places along the Pacific Coast Highway that are discussed in greater detail in the next section. Now here are my favorite 15 stops from that list, primarily sticking to only those cities and towns that are between San Francisco and Los Angeles with one exception. My list is subjective and based on the places I chose to spend more of my time over the past 5 years! However, many of the other stops are also very worthwhile and I definitely recommend you choose your stops based on your own interests. If you have time to head north of San Francisco to explore another destination on Highway 1, I’d recommend a trip to Point Reyes National Seashore. This large protected area extends 71,028 acres and includes 80 miles (130 kilometers) of shoreline. 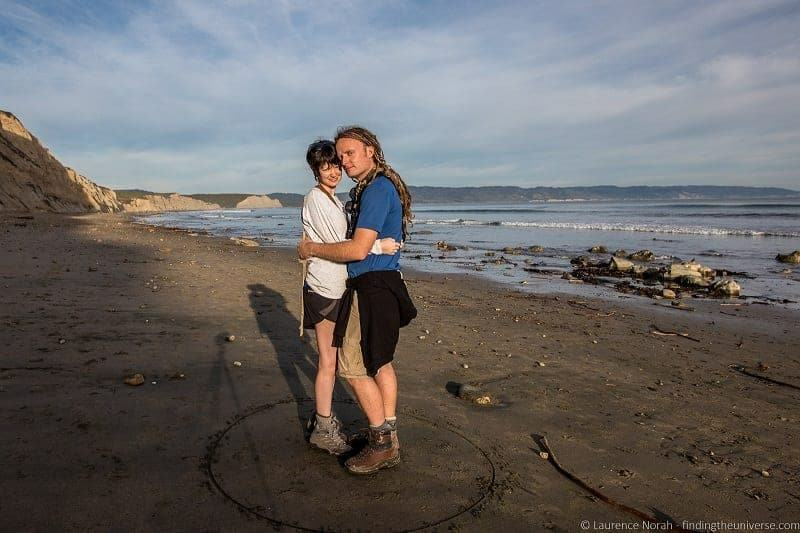 This is a favorite nature weekend getaway for many people in the San Francisco Bay area and it is particularly special to us as we got engaged here while standing next to an elephant seal on Drakes Beach. I would recommend spending a full day (or more) here exploring the trails, beaches, coves, and historical sights. A stop at the Bear Valley Visitor Center near the entrance can help you get oriented to the park, check on hiking trail statuses, and let you know what activities are available during your visit. If you only have a day, I’d recommend the hike to Alamere Falls (Alamere Falls is a scenic waterfall that falls directly onto a beach), a walk along one of the beaches, and a visit to the Point Reyes Lighthouse (if open). The colorful city of San Francisco needs no introduction and the number of things that you might want to do here are almost endless depending on your time and interests. If you are visiting for the first time, you might consider an early morning start from Union Square (major shopping area) to take an iconic cable car to explore Fisherman’s Wharf, then perhaps a cruise to Alcatraz, and then walk or take a bus to explore one of the other neighborhoods (Chinatown, Castro, Haight-Ashbury, etc.) or to visit a museum (SF Museum or Modern Art, de Young Museum, The Disney Family Museum, etc.) that attracts your attention. You’ll also want to take a look at the famous Golden Gate Bridge, and perhaps take a walk or bike across it. You might also consider booking a walking tour of some of the other iconic neighborhoods or a food tour given San Francisco’s well-known culinary scene. I am also a big fan of taking some time to visit Golden Gate Park which in addition to being San Francisco’s largest green space, also contains a number of museums, historical monuments, gardens, and sport facilities. My very first day trip in the San Francisco Bay area was to Half Moon Bay, and I would return many times over the five years I lived there. Half Moon Bay is a small coastal town locally well-known for its annual pumpkin festival in October and internationally known for hosting the big waves surf competition called Mavericks. There are no big attractions here, just a great coastal small town atmosphere. Popular things to do include visiting the beaches, biking, and shopping at the local stores. Many of the shops and restaurants cluster around the downtown on and off of historic Main Street which offers a pleasant area to stroll. Generally on a day trip visit, I tended to find myself stopping at a fruit stand on the way to pick up some lunch goodies, buying sandwiches in town (there are several good delis such as San Benito Deli), walking around the downtown area, and then spending time picnicking, walking, and playing around on one of the beaches. One of the beaches I tended to spend the most time on was at Francis Beach which is part of Half Moon Bay State Beach. If you have more time, other things I’ve enjoyed include riding horses along the beach trails (I’ve done the Early Bird Special ride with Sea Horse Ranch) and walking around Pillar Point Harbor (the Mavericks competition is held nearby). I’ve also enjoyed staying overnight at a local bed-and-breakfast, and seeing the great view overlooking the ocean from the very well-positioned 5-star The Ritz-Carlton Hotel. At the latter there are 25 parking spaces reserved for free public use if not staying or eating at the hotel – just ask at the hotel entry gate. I would recommend avoiding Half Moon Bay during Mavericks (I’ve been and its honestly almost better to watch online or via TV) and the weeks around the pumpkin festival as the traffic and crowds can be quite terrible. Santa Cruz is a oceanside city that is best known for its surfing, social activism, beach boardwalk, and being home to University of California, Santa Cruz. On a day trip, I’d recommend considering a drive (or preferably a walk) along West Cliff Drive for scenic views, a visit to the Santa Cruz Beach Boardwalk (in addition to the beach and boardwalk, there is an amusement park, arcade, and other family-oriented attractions), a walk around the downtown area (especially if the Farmer’s Market is happening), and a visit to Natural Bridges State Beach. If you like to surf, this is widely considered by many to be one of the best surf cities in the country. You can also find the To Honor Surfing Monument and the Santa Cruz Surfing Museum along the aforementioned West Cliff Drive. If you have more time, other things you might consider are a visit to one of the local beaches away from the often crowded boardwalk area, the infamous Santa Cruz mystery spot, a visit to one of the local breweries or wineries, hiking (nearby Big Basin Redwoods State Park is a local favorite of mine and the oldest state park in California), or a scenic train ride. Roaring Camp Railroads operates diesel-electric tourist train that go between the Santa Cruz Beach Boardwalk to the Roaring Camp in nearby Felton and also a great 19th century steam train ride that goes through the Henry Cowell Redwoods State Park. I really enjoyed the steam train ride I did here a few years ago and it also gives you a chance to walk around in an ancient redwood forest. 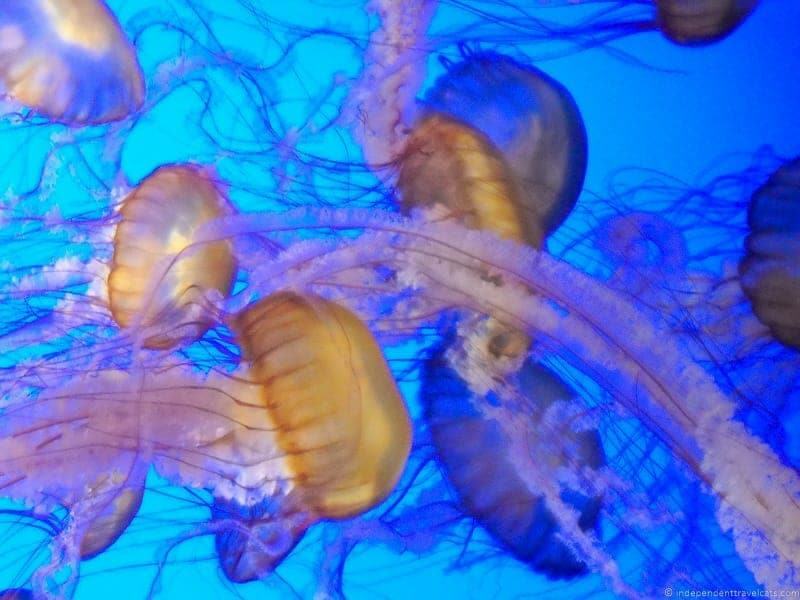 Monterey is best known to visitors for its cannery history, its diverse marine wildlife, its proximity to the golf courses of Pebble Beach, and for having one of the best aquariums in the country. For a day trip, I’d recommend walking around the Cannery Row and Fisherman’s Wharf area, a visit to the Monterey Bay Aquarium, a sea food lunch or dinner, and perhaps take a drive on the famous 17-Mile Drive for scenic views, famous golf courses, and the Lone Cypress. Marine wildlife, such as sea otters, harbor seals, jellyfish, dozens of sea birds, and even whales, are often seen on the coast and along the waterfront so keep your eyes open! If you are a John Steinbeck fan, you may want to make a trip to the National Steinbeck Center located in Salinas, CA (17 miles from Monterey). Kids and adults might have fun expending energy at the Lake El Estero city park as it is home to the Dennis the Menace Park created by the comic strip artist. In nearby Pacific Grove, you’ll find some good restaurants (I tend to eat here when staying in Monterey) and you can also visit Point Pinos, the oldest continually operational lighthouse on the West Coast, or the Monarch Butterfly Sanctuary (during late autumn and winter months only). With a name like Carmel-by-the-Sea, you can’t help but expect a little seaside town with nice beaches, cozy bed-and-breakfasts, cute shops, and maybe a few candy stores, right? Well, Carmel has all of those things and was one of my favorite weekend oceanside getaways when living in the San Francisco Bay area. There are no big attractions here and the things that I’d highly recommend are long strolls along the pretty sandy Carmel Beach and strolling along the downtown area that is full of shops, art galleries, spas, and restaurants. I am not into shopping very much, but I have bought several things in Carmel over the years as it has quite a few unique little shops. Carmel is well-known for being very pet-friendly (you can take your dog to many of hotels, beach areas, and even restaurants here) and for attracting celebrity residents, including having Clint Eastwood as its former mayor. Clint Eastwood fans can visit a bar Eastwood formerly owned, Hog’s Breath Inn, and stay and/or eat at the well-reviewed hotel he currently owns called Mission Ranch. Doris Day fans can stay at her centrally located and very pet-friendly Cypress Inn or you can just stop in for some tea like I have done in the past or for a meal or cocktail. If you haven’t already visited one of the Spanish missions in California yet, you might visit the Carmel Mission, Mission San Carlos Boromeo del Rio Carmelo, established in 1771. For hiking, I highly recommend nearby Point Lobos State Natural Reserve (about 3 miles from Carmel; pets not allowed). Big Sur is not an actual town but refers to the sparsely populated region along about 90 miles (140 km) of rugged coastline from approximately the Carmel River to San Carpoforo Creek. Until the 1950’s this area was seldom visited and most residents didn’t even have electricity. It was Highway 1 that would make this area more accessible and later bring tourism to this area. Today, it still offers a lot of relatively unspoilt coastline, beaches, forests, and wilderness area. 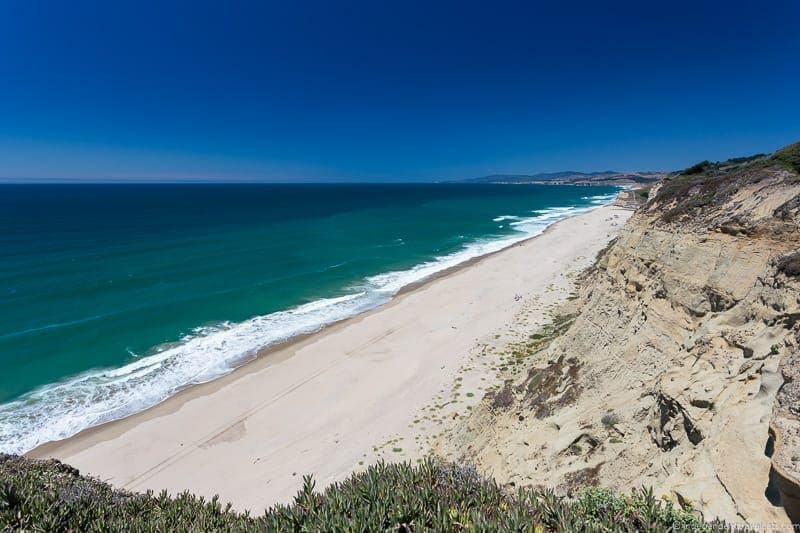 The most popular thing to do is to simply drive along Highway 1 and admire the scenery and there are off-the-road viewing points here and there along the way where you can safely park and admire the view and take photos. There are several state parks in the area, and Big Sur also offers hiking, camping, mountain climbing, kayaking, boating, and other outdoor activity opportunities. Three notable points of interests (all can be seen from the road) are the Bixby Creek Bridge (you’ll drive across it on Highway 1), McWay Falls located within Julia Pfeiffer Burns State Park (access to the waterfall by foot is often prohibited), and the Point Sur Lighthouse which is part of Point Sur State Historic Park (guided visits available). Note that tourist related services are limited including lodging options, so you should plan ahead to reserve a hotel or camping site or plan to drive through the area and stay elsewhere. It is an easy drive to do in a day even with frequent photo stops. Note that heavy rains, landslides, fires, and other weather-related events do often close parts of Highway 1, especially this section, so do check highway conditions before your visit! Tiny San Simeon is home to the most popular tourist attraction along California’s Central Coast: Hearst Castle. Hearst Castle is a hilltop mansion built by the late newspaper magnate William Randolph Hearst with the aid of San Francisco architect Julia Morgan. Construction of Hearst’s dream mansion begun in 1919 and building would continue for 30 years. Today, visitors flock to this popular attraction that is well-maintained by the State of California. 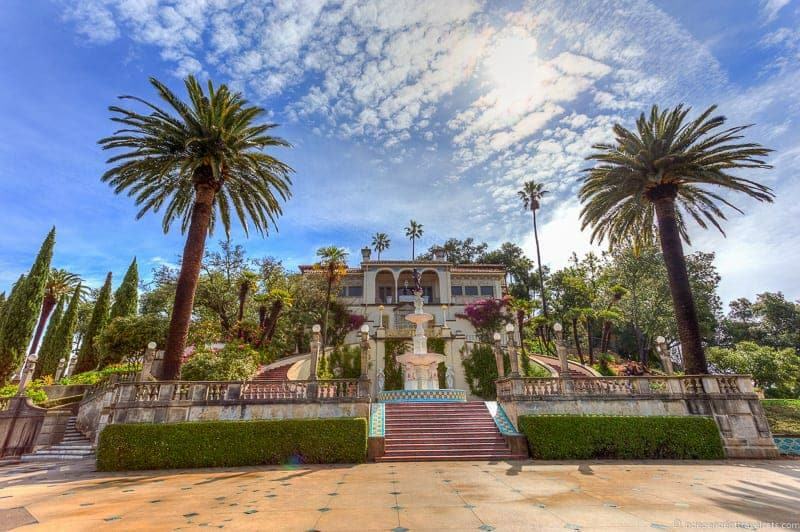 I have visited twice and really enjoyed the guided tours of the buildings and the self-guided tours of the beautiful gardens; you can read about our visits and tips for visiting Hearst Castle in a prior post. Not only does little San Simeon have the mighty Hearst Castle, it also has the Piedras Blancas Light Station, the Elephant Seal Rookery (thousands of elephant seals can sometime be seen on the beach! ), and the William R. Hearst Memorial Beach with its wooden pier and small educational Coastal Discovery Center. Despite its small size (less than 500 residents), you can easily spend half a day to a full day in this town. Cambria lies just about at the midpoint of your Pacific Coast Highway road trip between Los Angeles and San Francisco, and offers visitors shopping, beaches, scenery, outdoor recreational activities, and excellent dining spots. Both Cambria and San Simeon make for easy Pacific Coast Highway stops. Cambria is located about 10 miles from San Simeon so it is very easy to visit Hearst Castle and all the other San Simeon attractions if you base in Cambria. If you only visiting on a day trip, I’d recommend walking around the historic downtown, trying a slice of olallieberry pie at Linn’s Easy as Pie, visiting pretty Moonstone Beach, and having a meal at one of the many Cambria restaurants. With more time, I’d recommend a hike at Fiscalini Ranch Preserve, a tour of quirky Nitt Witt Ridge, and perhaps tasting some local wine or beer. We recently spent three full days in Cambria and you can read our full post of recommended things to do in Cambria to help plan your time here. 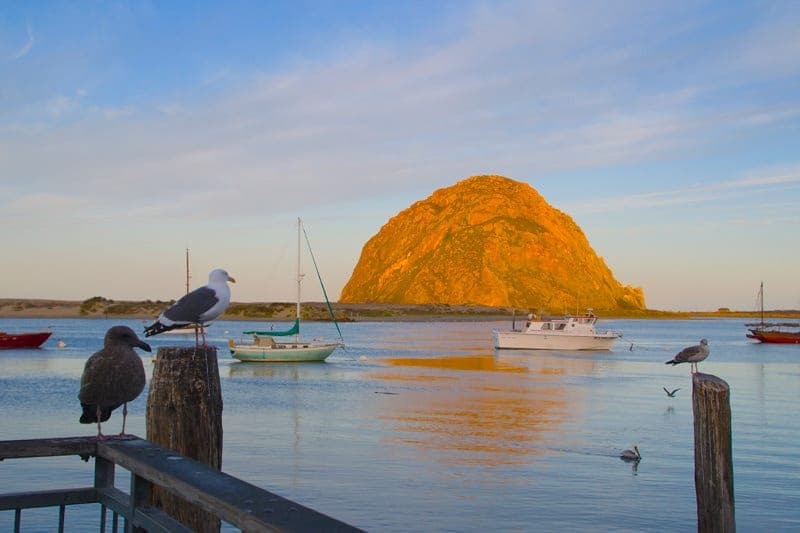 Morro Bay is a charming seaside town with a bustling waterfront, charming old town, numerous antique stores, and an enormous landmark in the form of Morro Rock which sits in the harbor. You’ll probably notice the large iconic Morro Rock from miles away as you approach the city, a must-see in the city but note that you can’t walk or climb on the rock. Morro Rock is actually a 481 ft. volcanic plug and is the most popular of the many volcanic hills and plugs in the area; a chain of nine of these plugs in the Los Osos Valley is known as the Nine Sisters. On a day trip, I’d recommend strolling along the waterfront and harbor, a stroll along the downtown area (most shops cluster around Main Street and Morro Bay Boulevard), a visit to the Morro Bay Museum of Natural History, and a kayaking adventure within the Morro Bay Natural Estuary (see info on Los Osos above as well). 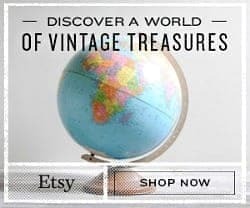 If you like vintage clothing shops, speciality stores, and antiques stores, you’ll find over a dozen in Morro Bay and you can read about the time we went vintage shopping in Morro Bay. One of our favorites stores, although not located in the downtown area, was Highway 41 Antique Emporium, where we were able to drink wine while browsing the large antique store. There are a number of good cafés and restaurants in Morro Bay and one place we recommend for lunch (or a weekend breakfast) is Shine Cafe, which is a popular local vegan spot featuring fresh and organic ingredients. Los Osos is another small town, sitting right next to larger Morro Bay, and while often overlooked is a great place for hiking, bird watching, water adventures, and other nature activities. 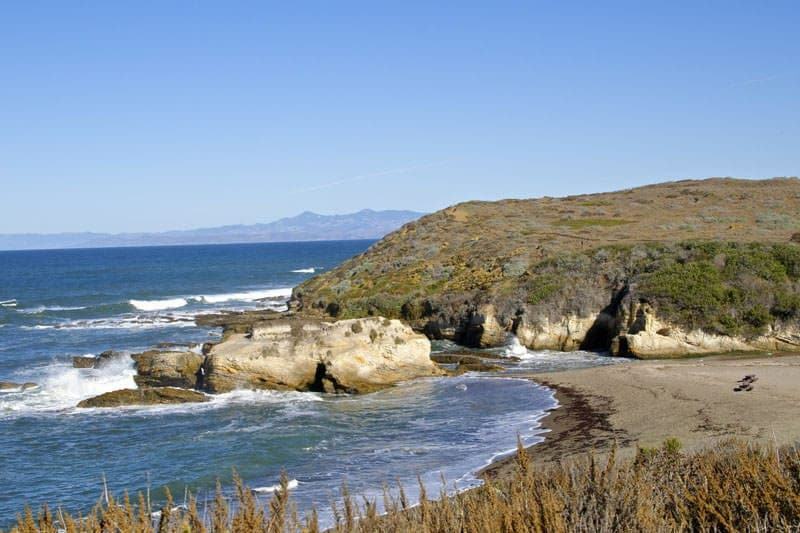 With a day in Los Osos, I’d recommend hiking a couple of the trails at Montaña de Oro State Park, one of the most beautiful oceanside parks in California (Spooner’s Cove is stunning! ), and a kayaking adventure along the Morro Bay Natural Estuary. For food, perhaps a hamburger and beer at the popular local burger joint, Sylvester’s Burgers, or a coffee at laid-back Back Bay Cafe followed by a stroll along the bay. With more time, I’d check out one of the other nature preserves or parks in the area. You can check out our earlier post about a weekend we spent in Los Osos for more tips on what to do in Los Osos. Pismo Beach is a good place to visit if you are looking for a classic California beach town. There are of course other things to do (wine tasting, shopping, dining), but the best thing to do here is to enjoy the beach and go sand dune riding if that is your thing. The most popular attraction if you stop here is the long wooden Pismo Beach pier. Swimming, kayaking, surfing, fishing, boating, kite boarding, and other water-related activities are popular. Another unique thing to do here is sand dune riding at Oceano Dunes State Vehicular Recreation Area. Oceano Dunes is the only California State Park that allows vehicles to be driven on the beach. Four wheel drive or all wheel drive vehicles are recommended for driving on the beach and to the camping and off-highway vehicle use areas in the park. For food, you may want to try one of the famous Pismo clams or the local clam chowder, although the clams are becoming more and more scarce as they were severely overharvested in the past. Pismo Beach was once known as the “Clam Capital of the World” given the abundance of large Pismo clams that could be found on its beaches, but sadly that time has long since past although you can still find a gigantic concrete clam statue at the southern end of Price Street as you enter Pismo Beach. If you visit in the late autumn or winter, you might want to make a stop at the Monarch Butterfly Grove where you may see thousands of Monarch butterflies clinging to the trees in Pismo Beach during their annual migration. 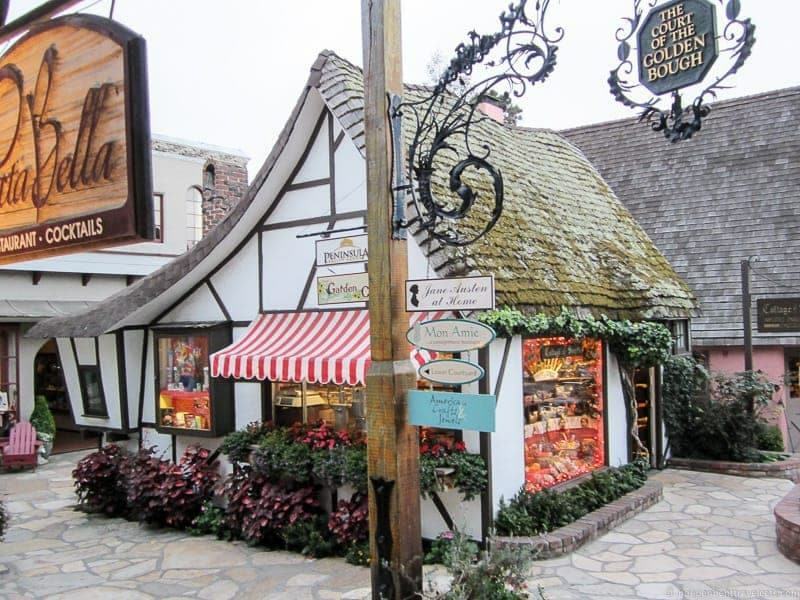 Solvang is a little slice of Denmark that can oddly be found in sunny California, and unlike the others on this list it is not a seaside town. Found in 1911 by a group of Danish immigrants, Solvang would eventually have Danish speaking schools, a Lutheran church, and be filled with Danish-inspired architecture. 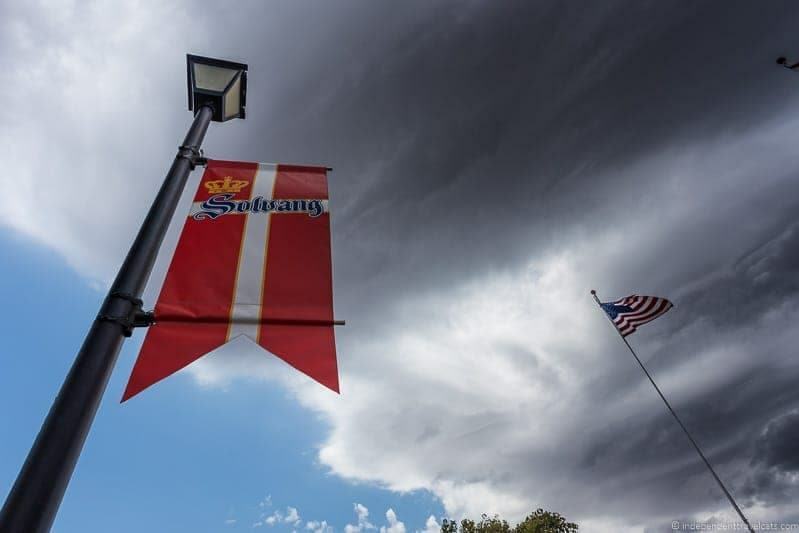 While cultural ties still exist between Solvang and Denmark, including a royal visit in 2011, only about 10% of residents still claim a Danish heritage. However, the half-timbered houses, rooftop storks, windmills, and unique European atmosphere has made Solvang a popular tourist destination. On a day trip, I’d advise a walk around the downtown area to explore the Danish architecture, shops, eateries, wine tasting rooms, and little parks and to try at least one of the Danish specialties such as the popular asæbleskiver (a sort of Danish pancake). If you don’t want to walk, you can take one of the horse-drawn wooden streetcars to explore the town which is a replica of a 19th century Danish Hønen. Fans of Hans Christian Andersen can enjoy the half-size bronze replica of the famous The Little Mermaid statue in Copenhagen (Denmarket Square), the bust of the fable writer in Solvang Park, and the small Hans Christian Andersen Museum located above The Book Loft store. For those interested in Danish heritage and the history of the area, the best place to learn about the area is through a visit to The Elverhøj Museum. Children may enjoy expending energy at the very kid-friendly Hans Christian Anderson Park, whereas my favorite nature break is to take a short wooded hike in nearby Nojoqui Falls Park (about 7 miles away from downtown) to visit the wispy 80-ft high waterfall. Cycling and horseback riding are also popular outdoor activities in the area; the Alisal Guest Ranch is a popular places for the many horse enthusiasts who flock to this area. Around Solvang, you can see and feed ostriches and emus at Ostrichland USA, see the miniature horses at Quicksilver Ranch, and admire the lavender fields and shop for lavender products at Clairmont Farms. The entire Santa Ynez Valley area is famous for wine and you can visit a number of wine tasting rooms and wineries in the area, especially in nearby little Los Olivos. If you are a fan of the 2004 movie Sideways, you can follow in the footsteps of the characters along the Sideways movie wine tasting trail. Lastly, if you like quirky roadside attractions and a good bowl of pea soup, you’ll want to plan a pitstop at Pea Soup Andersen’s in nearby Buellton. 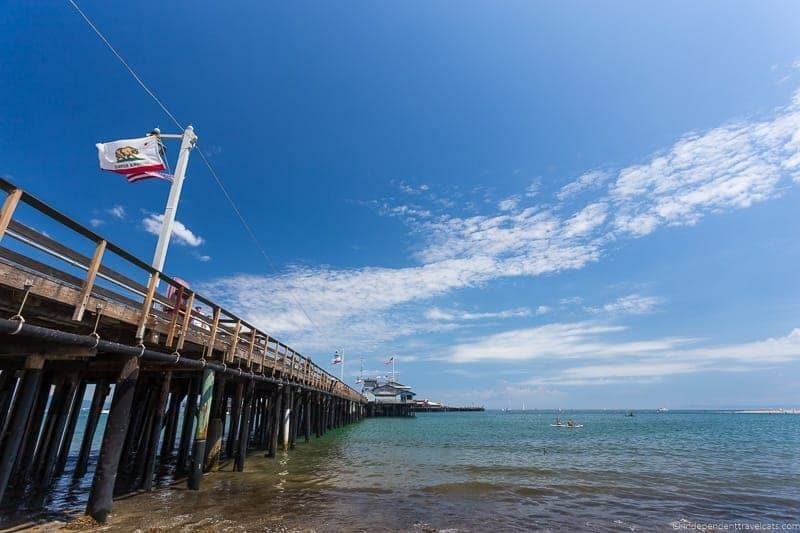 Santa Barbara is great bet for a warm weather spot and it is sometimes referred to as the American Riviera given its stretch of beaches, hills, and Mediterranean-style stucco Spanish colonial buildings. Unlike many of the other smaller towns mentioned, Santa Barbara also has numerous historical and cultural attractions as well as many well-regarded dining spots and performance venues that makes for a wide range of potential activities during a visit. For a day trip, I’d recommend checking out the waterfront including the popular Stearns Wharf (go early or late to best avoid crowds), exploring the shops, wine tasting rooms, and restaurants along the lower end of State Street, and paying a visit to a few of the city’s best historical sites: Mission Santa Barbara, the Presidio of Santa Barbara, and the Santa Barbara County Courthouse (great view of the city from the tower). With more time I’d consider some of the following: a visit to one of the museums such as Santa Barbara Museum of Art or Santa Barbara Museum of Natural History, doing the full self-guided Red Tile Walking Tour for those interested in the red-tiled buildings and Spanish colonial sights, relaxing on a beach in the Mesa area of town, and booking a nighttime performance as the city has a number of venues for performing arts, concerts, films, and classical music performances. In addition to the many wine tasting rooms in the city, there are also many wineries outside the city that can be visited on your own or on a booked tour. For those with more time and an interest in island exploring, a trip to Channel Islands National Park is possible from the cities of Ventura and Oxnard. Los Angeles is a large, sprawling city that is best known for being the center of the country’s film and television industry. It is home to world-class museums, cultural attractions, beaches, performing arts venues, shopping, dining, lodging, and sports teams. Los Angeles has dozens of museums and cultural attractions from the Getty Museum and California Science Center to the Griffith Observatory and Petersen Automotive Museum. 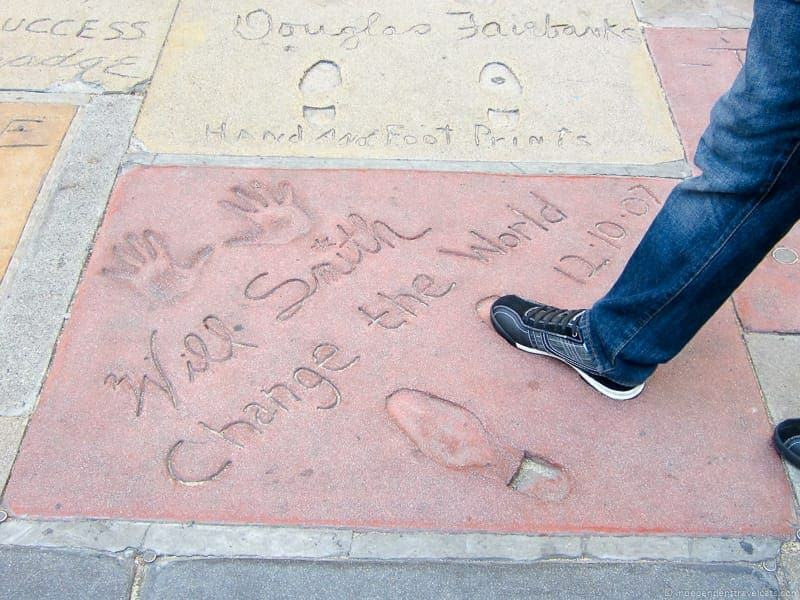 For those interested in Hollywood and the film industry, one can visit several movie studios such as Universal Studios and Warner Brothers, visit the historic TCL Chinese Theatre, marvel at the Hollywood sign, stroll down Hollywood Boulevard and the Walk of Fame, visit the Hollywood Museum, and so many other celebrity and movie-related attractions. Los Angeles is a major shopping destination for many visitors, whether one has an interest in retro vintage clothing or the high-end luxury boutiques on Rodeo Drive. Numerous beaches and boardwalks can be found along the coast from the famous Venice Beach to the Santa Monica Boardwalk to the scenic El Matador State Beach in Malibu. Santa Monica is also the ending (or starting) point for Route 66 if you are interested in another iconic American road trip! If you like sports, you might want to book tickets for a sports game during your stay as Los Angeles is home to the several prominent professional sports teams: the L.A. Dodgers (as well as the L.A. Angeles who play in Anaheim), Kings, Lakers, Galaxy, and Clippers as well as notable college teams such as the UCLA Bruins and the USC Trojans. There is almost an endless amount of things to do here and you can read a whole guidebook just on things to do in Los Angeles. If you have only a short time in the city, I’d recommend focusing on a main interest (art, food, Hollywood, luxury shopping, beaches, etc.) to develop an itinerary or pick a couple of neighborhoods to explore. I’d recommend walking, taking buses, or using the metro when possible as driving and parking can be a nightmare. There you have it, our Pacific Coast Highway road trip tips and advice, as well as information on our top 15 recommended stops. 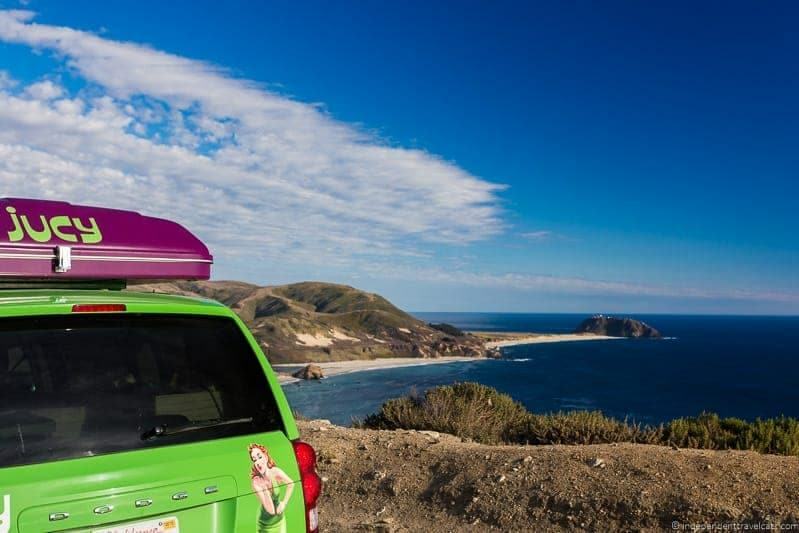 We had a great time traveling along California’s Pacific Coast Highway in our JUCY campervan, and we hope you’ll have a blast as well. For more inspiration, check our our California road trip post, which covers even more of the state, as well as our guide to some of the world’s best road trips, which of course includes the PCH! Have you ever driven along the California coast on the Pacific Coast Highway? If so, what were your favorite stops and memories along the Pacific Coast Highway? As always, feel free to ask us questions about our trip, or share you own tips and advice! I was planning a road trip for my dog and I. Any recommendations on places to stay and sights to see. Molly is a 10 year old yellow Labrador who loves the beach and people. Hi Celia, Yes, you will need to find which places on our list sound most attractive to you and then I would do a search specifically of the ones that allow dogs. Many beaches do allow dogs (often on leashes) but some don’t allow any pets, so you’ll just need to check the guidelines for each place. But there should still be plenty of places to go, especially if you are focused more on outdoor activities. I haven’t traveled the route with a dog (just cats) but a couple places that stood out as being extra dog friend were Carmel and and Santa Barbara. In terms of places to stay Cypress Inn in Carmel is very renown for being super dog-friendly and many of the beaches and even restaurants are dog-friendly here. It is very dog-friendly place. Santa Barbara is also a pretty dog-friendly place along the route and many of the beaches and hotels are dog-friendly, you can see a good list here. Many of the hotels are located right next to the beach or a short walk away which sounds like that may be perfect for you. So we plan on flying into San Francisco and staying 1 night, want to see the golden gate bridge for sure, and probably look around the downtown area. some areas we heard that are nice is monterey, ,Carmel, santa cruz bixby bridge santa barbara big sur, Venice beach and santa monica pier, LA and san diego. its just me and my husband traveling. We know we want to spend 1 night in San Francisco, 1 night in LA, 2 nights in San Diego and 2 nights in Las Vegas. We want to take in the sites. Like to visit towns and shops. Love boardwalk not big on museums. Want to see the sea lions. Thought we can touch towns for quick visits. I am just afraid of booking a hotel ahead of time and we go there and decide we don’t want to stay. Being that we want to go in October can we book last minute? Our budget is 100- 150 a night. Just need a bed to sleep, what do you think? I’d probably recommend 2 nights in San Francisco since it is where you arrive and I think you’ll enjoy the downtown, shopping options, Golden Gate Bridge, Golden Gate Park, wharf area, and Pier 39 is one of the best places to see sea lions, they are almost always there. Lot of great neighborhoods to explore and lots of good dining options, and of course there is also attractions like Alcatraz. You might also consider a day tour like this to see the Redwoods and/or tour up to Napa for a day of wine tasting w/o having to worry about driving. Based on what you want to do, I would consider overnighting in Santa Cruz, Monterey, and/or Santa Barbara. All of these places have some attractions, shopping opportunities, and things to do (see article for highlights in each) and two have boardwalks. All have a number of lodging options. Since your budget is at the lower end for some of these cities/towns (California coast is much higher on average than other parts of the state), I would recommend booking ahead or you might be left with some not-so-nice motels or having to pay more than you want. If there is a festival or event going on that weekend, prices can double and there may be few options if you try to book last minute. If you book online, most will allow you to cancel your booking 24 to 48 hours in advance if you change you mind. There are lots of events and festivals in October along the route, for example Fleet Week (San Francisco), Pumpkin Festival (Half Moon Bay, expect lots of traffic in this area during festival), Clam Festival (Pismo Beach) etc. so we’d recommend planning ahead. But of course you have to do what is best for you and your travel style. Hi, what a wonderful page with lots of great information, thank you! My wife and I are celebrating our first anniversary with the PCH trip. We fly into SF on 4/6 and fly out of SD on 4/13. So hopefully not too rushed with only 7 nights. Wanted 2 nights in SF 4/6 and 4/7 and then thought about driving to Cambria (halfway) staying one night 4/8. Then on to Santa Monica for 2 nights 4/9 and 4/10, Drive to SD for 3 nights 4/10, 4/11, 4/12. Fly back home on 4/13. Any thoughts on that? Will it be too much driving and not allow for many stops? Should we add an additional stop on PCH and cut out a night in SD? Should you book hotels along PCH in advance or can you find good ones last minute? How is the weather in early April? Thank you again for your page and answers to comments! Hi Matt, I think 7 nights is enough time. You won’t have time to stop in all the towns and cities along the way, but you should still have time to pick your favorites to explore and see the highlights of San Francisco and San Diego. Personally, I would probably spend 2 nights in Cambria instead of 1 if you can as otherwise you won’t have much time on the PCH portion of your trip. 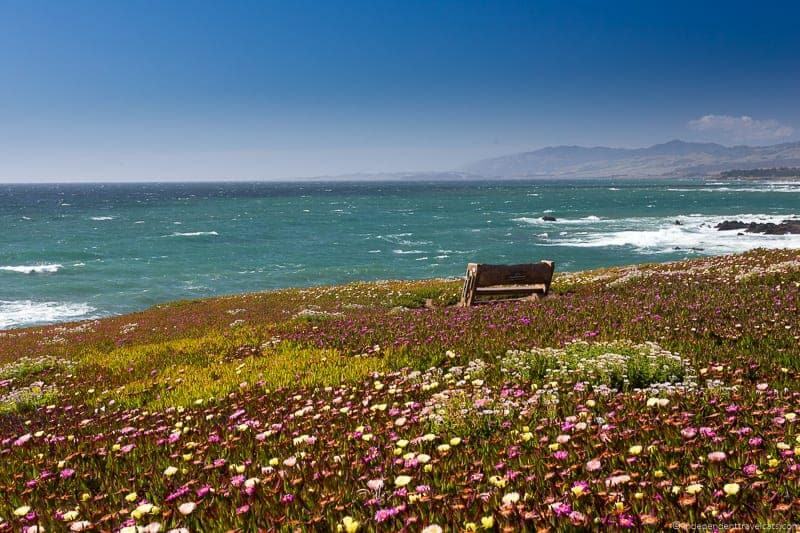 That extra day will give you time to explore the nearby towns and coastline around Cambria. But it really depends how much you want to spend in the cities versus smaller towns so it is really up to you of course. I would book your accommodation in advance. You’ll normally find better rates and better places to stay in advance rather than waiting to see what is left. If you happen to be staying on a busy weekend/week in some places (e.g., a local festival), rates can double. In Cambria, if you are looking for a more romantic couples-friendly spot for your anniversary, we would recommend perhaps the El Colibri Hotel & Spa (boutique hotel near beach with wine bar and spa) or the J Patrick House B&B. We are traveling this June for our 40th Anniversary. This is what we were thinking. Please help me adjust. We were thinking 12 days, 11 nights. Fly into Seattle on the 30th, stay over night there, star our journey and end in San Diego on the 12th. I have seen the wine country and SF, but my husband has not, so I was just just think one day there. But I’m missing 2 nights. Help! First, is there a specific reason you are thinking about flying into Seattle rather than San Francisco for this trip? Unless there is a strong reason to start there, I’d start in San Francisco. It is a 13 hour drive (by Interstate not the scenic route) from Seattle to San Francisco and just taking that drive will take up at least 1 entire day/night of your trip. If you do want to start in Seattle, I’d recommend a couple of stops in between Seattle and San Francisco to enjoy the area in between, especially if you want to hug the coastline and avoid the Interstate. So that’s 10 nights above, still leaving you to add 1 more to a spot you really want to explore further. For instance since you are interested in both Santa Cruz and Monterey, you might want to spend a night in each. Since you have 12 days, I’d try to book 2 night stays rather than 1 night ones when possible as it’ll feel more relaxed and give you more time to visit the attractions in the areas and do activities like hiking and wine tasting. Wow, glad I found your PCH road trip itinerary. So informative and helpful! I wonder what you think our San Francisco to LA travel plans for the end of March. It will our first time visiting with a 12 year old (girl) & 14 year old (boy) in tow. We have 8 full days (9 nights) in CA. Are spending 3 nights in San Francisco, though the last night we thought maybe we would spend in Sausalito or Tiburon, for a little quiet and also to be closer to Muir Woods for an early half day visit after getting car in Mill Valley. From San Francisco, drive to Monterey, stay 1 night. Next day visit Monterey museum, then drive down PCH seeing Big Sur sites along the way and stay 1 night in Pismo Beach. Next day continue on to Santa Barbara, stay 1 night. Last 3 nights will stay in Santa Monica, and it will be our base for exploring LA. What is your thought on staying 3rd night out of SF? Also do you think it better to stay 2 nights somewhere between SF and SM, or okay with the 3 nights at different locales? I think your itinerary plans along the PCH are good and spaced out nicely given the number of days you have. I would probably spend the 3 nights in the different places and then do 3 nights in the cities (SF and LA) on the ends. So you do have the 1 night stands in the middle but have longer stays at the ends which are nice. In terms of spending the third night in San Francisco or not, I guess it depends on when you are picking up you car and how much you want to see and do in the city. It is only about a 1 hour drive (including some traffic) from central SF to the Muir Woods visitor center so it is not a huge distance. Personally since you have limited time in San Francisco, I’d probably spend all 3 nights there and then head out on the morning of Day 4 to visit Muir Woods and start your road trip. It will also save you needing a car on Days 1-3 or needing to change hotels. Hi. We traveling from Los Angeles to San Francisco from the 19th to the 26th of April. WE fly back to NYC on the 27th. We have taken this trip to drive the PCH. The next day we drive to San Luis Obispo and spend the night (21st) there. The next day we drive to San Simeon and spend two nights (22nd and 23rd). Two days later we drive to Carmel and spend two nights (24th and 25th). On the 26th we drive to San Fran and spend our last night there. 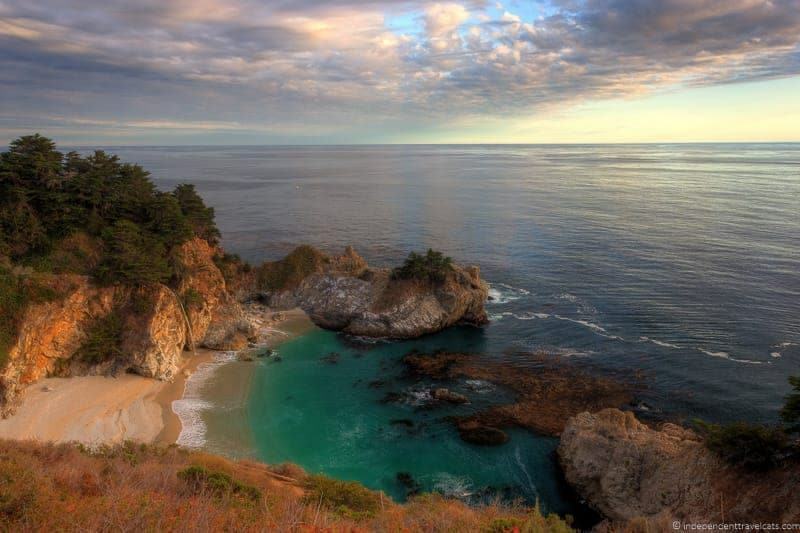 We really want to see Big Sur (probably our highlight during the trip). Does this sound doable? Thanks. Wishing you a wonderful trip and just let us know if you have any questions as you plan the rest of your trip to California. I’ve loved reading all about the trip and I’m kicking myself that I didn’t plan a longer time in CA but would love your suggestion for the days we do have. I’m struggling with how long to stay in SFO. We originally were going to stay 3 days and drive to LA (stay in Beverly Hills) for 2 days but after reading the road trips, REALLY want to drive HWY 1 and stay along the way. What we really want in SFO / Napa Valley – can this all be done Saturday & Sunday and then go down HWY 1 later Sunday and stay somewhere? Or is this to rushed? Union Square, Fisherman’s Wharf, Cruise to Alcatraz, Golden Gate Bridge. If that’s all doable or not…I’m open for suggestions. I know it will be a whirlwind trip but I really want to see as much as I can in little time…or take in the most must see’s. Looking forward to your suggestions. I think if you only spend 2 days in San Francisco, then I’d probably skip Napa Valley as otherwise you’ll see little of the city and be very rushed. If you stay 3 days, then you’ll have more time to do a day trip north to Napa. If you want to see as much as possible, we’d recommend joining a walking tour or two such as this one by Take Walks that takes in most of the SF highlights in one day. If you want to go to Alcatraz, you’ll want to book in advance as tickets typically sell out in advance. If you go to Napa I’d probably book a day tour (such as these ones here) unless you plan to overnight there so you can do wine tasting without worrying about driving as you won’t want to drive if you do more than one tasting. If you decide to skip Napa (I’d only do it if you have most of the day to enjoy it), you can plan a stop to one of the Central California wineries or tasting rooms (several around Monterey, Los Olivos and Santa Barbara areas). If you decide to spend a full day along the PCH and overnight along the Pacific Coast Highway / Highway 1, I’d recommend one of the towns between Cambria and Santa Barbara, depending on how much time you have and when you need to be in LA the next day. Hi Jessica, I have found your blog so helpful in planning out trip to California. We are arriving into San Fran on 26th September and spending 4 nights there. We are then heading to Yosemite for 2 nights. We fly home from LA on 11th October so are planning on spending 3 nights here before we leave. Please could you recommend which area would be best to stay in LA? 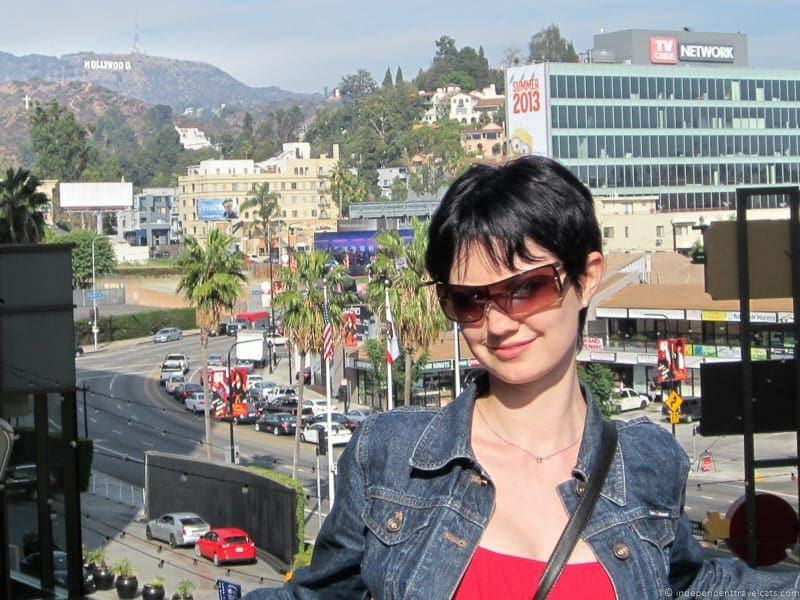 A friend has recommended West Hollywood however I thought it might be nice to stay near the beach around Santa Monica. After Yosemite we plan to head back over to Santa Cruz/Monterey area and then we will have 6 nights for the drive down to LA. We want to be able to relax and spend a few days by the beach rather than driving every day. I was thinking perhaps 3 nights near Carmel by the sea, a night near Cambria (we want to go to Hearst Castle) and a night near Santa Maria or Santa Barbara (we also want to visit solving). First, I think your itinerary in general sounds fine and very doable given you have plenty of time to enjoy each place. In LA, if you are wanting to be near the beach, then Santa Monica or the Venice Beach area is going to likely be a better location for you than West Hollywood. However, if you are wanting to be more near LA attractions, than you might consider West Hollywood or another more central area. I’d make a list of the attractions you most want to see and things you want to do and then decide what is going to work best. I think the time along the California Coast sounds great and we love time in Carmel and the surrounding area. Definitely visit Hearst Castle, one of my favorite attractions in that area. There is more to do and see in Santa Barbara than Santa Maria so I’d probably recommend an overnight stay there given your itinerary. Hi. My Husband and I will be travelling from Asia to California with our 1.5yo toddler (by then) in coming mid June. I have been researching and reading a lot about California roadtrip. I’m glad that I’ve finally found such helpful and detailed article written by you! We will be flying in to San Frans and fly back from Los Angelas. We have about 3 weeks to explore California and would like to detour to Yosemite for 2 nights. Tentatively we planned to stay about 5 days in San Frans and 2 nights in Yosemite. So probably a week to do the roadtrip on PCH then 1 week in Los angelas. Travelling with young toddler can be quite challenging so we not sure how should we plan the stops for PCH. Would you please advise? Glad you are finding our PCH road trip guide helpful in planning your trip. I think that with a young toddler, you will just want to travel more slowly and just plan to see less than you would on your own. I think your itinerary as planned sounds fine. You can rent a car when you are ready to leave San Francisco to go to Los Angeles as you don’t need one in SF. If you have 6 or 7 days for the Pacific Coast Highway part of your trip, I’d recommend making choosing 2 to 3 towns to stop in and doing day trips from there. Perhaps one along the northern part of the route (e.g., Monterey) and then a second town along the southern part of the route (e.g., Morro Bay). I’d choose one based on your interests. You can base in these 2 towns and do short day trips as you can. That would give you more flexibility then trying to move around every day or two. I’d also consider booking apartments or motels or hotels with kitchenettes during your trip. This way you have the flexibility to cook some of your own food and eat when you wish with you toddler who may not be up to going out to restaurants. Heading from San Fran to LA with two 15 year old girls. I don’t want them bored from all driving. Have 9 days but want to spend time in San Fran and LA as well. What would you all recommend for spending time at different locations and things to do with them. Maybe we don’t need 9 days?? So overwhelming. Would appreciate any input. Thanks in advance. Greatly appreciated. I think 9 days is a good amount of time if you also plan to spend some time in San Francisco and Los Angeles as well. Perhaps 2-3 days in SF, 3-4 days driving along the route, and 2-3 days in Los Angeles? But it really depends on your interests and what your children enjoy doing (e.g., art, museums, hiking, beaches, amusement parks, food, shopping, etc.) as teens can be difficult. It also depends on when you are going as some attractions are seasonal or weather dependent. The Santa Cruz Boardwalk is a popular spot for teens as it has an indoor arcade, laser tag, outdoor rides, and is located along the beach. But the outdoor parts are seasonal. If they enjoy amusement parks, there is obviously Universal Studios Hollywood and Disneyland. I’d just be sure to break up scenery and culture with some active stops as well. Some popular attractions that most people of all ages enjoy is visiting Alcatraz (SF), Lands End hike (SF), Pier 39 and Fisherman’s Wharf in SF, Monterey Aquarium, walking along some of the beaches, Hearst Castle in San Simeon, and doing a studio tour in Hollywood (e.g., Warner Bros). I’d also think about more active things like biking across the Golden Gate Bridge, doing a Segway tour of Golden Gate Park, a hands-on museum like the Exploratorium in SF, going to see a sports game or concert in LA or SF, a boat tour, doing go-karting or mini golf, doing a family hike (lots of opportunities along the route), etc. Thank you very much for taking the time to give me ideas along the route and where to stay. There is so much to decide. God bless you! Hi. Thanks for all the great information. I’m contemplating sf to la trip along route 1 August 2019. I’m concerned about my kids getting carsick (13 +9), and general road conditions. I did not like driving in some areas near Yosemite where the road dropped off steeply at edge of pavement. I’ll be doing the trip over several days, probably 2 to 3 hours actual drive time per day tops. It seems like it shouldn’t be a problem, just wanted to get your perspective on it. Sounds like a fun road trip and going slowly will definitely make the drive easier if your kids tend to get carsick. The roads are normally in pretty good condition although note that certain sections (particularly around Big Sur) are often affected by mudslides/washouts/rockfall and there tends to be a road closure there every year or two. So I would take a look at road conditions before you set out. In terms of curves and steep drop-offs there is a bit of this, especially around the Big Sur area. That is also the section that is close to the edge and cliffs, and there are some windy bits but along a large section of the route, the road doesn’t hug super close to the coast. The most windy and steep bits of the route, if I remember correctly, are also between Big Sur and Ragged Point. This is also a very scenic stretch though as well. I would start out and see how it goes. The good thing is that you can also jump on 101 if needed to skip certain sections. Just note that if you want to skip certain sections like the Big Sur stretch, it is best to decide by Cambria for the easiest route back to the 101. It sounds like you will be taking it slowly and have a lot of time, so I’d just take it a day at a time and see how your kids react. As I am sure you know, certain things like trying to read books or look at screens tend to make people more carsick so minimizing these types of behaviors when you are on more curvy stretches may also help. Note that August is one of the busiest times of year along Highway 1 so just be prepared for traffic and a lot of sightseers along the route between LA and SF. Lodging will also be more expensive so we’d recommend booking in advance. Hope that helps and enjoy your California road trip!! I’m wondering if between Pismo Beach and Las Cruces where hwy 1 doesn’t run along the coast if I’m better to take hwy 101. Yes, the driving time and distance taking Highway 1 or Highway 101 from Pismo Beach to Las Cruces is about the same, but if there is traffic, the 101 may be faster. But if you are wanting to visit Santa Maria, Los Olivos, or Solvang, then taking 101 may make more sense as Hwy 101 goes through or closer to each of these towns along this stretch. Jessica and/or Laurence, nice write up. My wife and I are taking our 2 boys (12 an 14) to San Francisco on Dec. 25 and flying out of LA on Jan 1. A few questions. 1) Any tips or advice for this time of year. I know it will cold, but we can handle that. We won’t be camping as that’s no our style. Already see Alcatraz is sold out, so we are having to use a 3rd party tour so we can step foot on the Rock. 2) Were thinking Santa Cruz boardwalk, amusement park and arcade would be right up their alley, but given time limits, maybe just doing Pacific Park in LA would be a better idea? 3) Any other teenage boy advice idea? Yes, winter does limit some of the activities and makes it a bit less fun to be out on the beaches etc. You also have limitations due to closures of some attractions around the holidays. But that said, there is still plenty to do and see along the Pacific Coast Highway and both SF and LA offer lots to do at any time of the year. If you like Christmas, Solvang in particular along the PCH is really known for its Christmas decorations and events. Many of the events take place pre-Christmas but it should still have all the lights and decorations should still be up until after New Year’s. With Alcatraz, be very careful in making a booking, as many companies sell cruises that don’t include actually getting on the island or being able to our the prison. The only cruise company that can take people to the island and dock is Alcatraz Cruises, and if they are already sold out, there will be very limited tickets available as part of tour packages through other companies. If you decide to pay for one of these tours, just be sure it is with a legitimate company and includes a ticket with Alcatraz Cruises. Scams for these tickets are fairly common sadly in SF. You can always call Alcatraz Cruises to ensure a particular tour company has the right to see their product. The Santa Cruz Boardwalk could definitely be worth a stop for your boys, particularly if they enjoy the indoor stuff offered (arcade, laser tag, indoor games). The rides are often closed in winter but some will be open during the time you travel, since it is during a school holiday, so I’d check the calendar. Same with Pacific Park and other oceanfront parks as almost all will have more limited operations, but will have more open on school holidays. If they enjoy amusement parks, there is obviously Universal Studios Hollywood and Disneyland. There’s also the Warners Bros. Studio. Um, teenagers can be difficult, and it really depends on what they each enjoy. I’d actually let them each maybe choose at least one thing they really want to do on the trip and do that as a family. I’d just be sure to break up scenery and culture with some active stops as well. 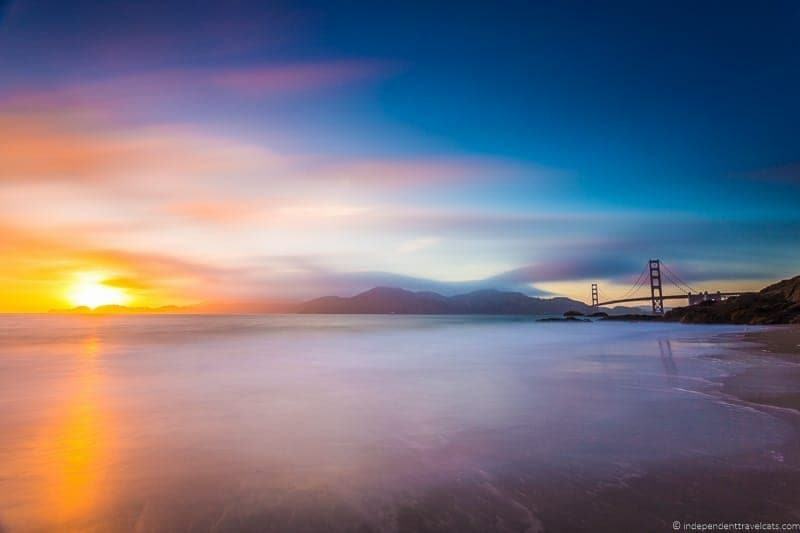 Some popular attractions that most people of all ages enjoy is visiting Alcatraz, Lands End hike, Pier 39 and Fisherman’s Wharf in SF, Monterey Aquarium, walking along some of the beaches, Hearst Castle in San Simeon, and doing a studio tour in Hollywood. I’d also think about more active things like biking across the Golden Gate Bridge, doing a Segway tour of Golden Gate Park, a hand-on museum like the Exploratorium in SF, going to a game in LA or SF, a boat tour, doing go-karting or mini golf, doing a family hike (lots of opportunities along the route), etc. Hope that helps and wishing you a great trip to California! planning a 3 day road trip from SF Airport starting sunday December 9 returning to SF Airport Tuesday, December 11th flight leaves at 830pm. Any recommendations for site seeing, restaurants and lodging for two nights? Hi Dan, It really depends on what you enjoy doing and what sounds appealing to you (e.g., wine tasting, beaches, surfing, museums, cultural sites, luxury holiday, shopping). Do any of the towns in the article sound like places you would enjoy visiting? You have limited time so I would not recommend trying to drive the PCH or head too far south to make the most of your trip. I’d think about places like Half Moon Bay, Monterey, Carmel, or Solvang and maybe base in one place for both nights and explore from there. Happy to provide recommendations for sightseeing, lodging etc. – just let me know in what town you think you might enjoy staying/doing and your budget range. Valuable information and tips! My spouse and I will be using this to plan our dream California road trip for Spring. Thanks so very very much for these great info. We are traveling with our three boys (21,19,15) on a 9 day trip starting in San Fransico to San Diego along the PCH. We get to SF on December 17 this year. A little overwhelmed by all the planning. Any advice you can offer would greatly be appreciated. Glad that you found our guide helpful in planning your PCH road trip to California. Happy to try to help. For the desert and national parks there are not any along the way so you will have to make detours if you want to visit them. I’d recommend looking at Yosemite National Park, Sequoia National park, Joshua Tree National Park, and Death Valley. Maybe pick a couple you’d like to visit. Although note that Yosemite can be more difficult in winter and some parts will be closed due to snow and many of the lodging options close during parts of the winter. The same may be the case for the other national parks as well so I’d check recommendations and weather conditions for December visits. Happy to recommend some hotels and attractions. Just a few questions: Are you flying out of San Diego at the end of the trip? What is your budget range for hotels and what kind of lodging do you prefer? Thank You for sharing , it do help a lot for my road trip itinerary! Let me start by saying I love all the effort you put into this article. My wife and I are visiting California this coming Christmas and would love to ride down the coastal highway from San Francisco to LA. Unfortunately we only have about 2 to 3 days to spend on the road since we plan on staying a few days each in both cities. What would you recommend we do as far as making stops and lodging along the way? I’ve personally been to Hearst Castle, 17 miles and Solvang but wouldn’t minding visiting again since I had good experience and my wife has never been. Any suggestion would be appreciated. Even with 2 to 3 days, you’d still be able to see a lot and you can choose a few towns that you want to explore more on depth along the way and maybe overnight in them. 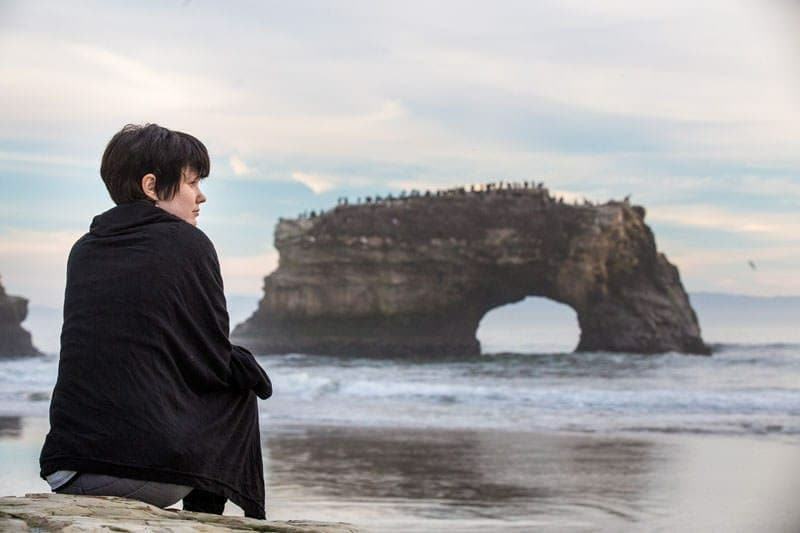 If you are starting in SF and have 2 nights, maybe consider stopping the first night in Monterey or Carmel-by-the-Sea and then the second night in Pismo Beach or Solvang. Happy to provide specific lodging recs, if you could tell me what type of place and general budget. I would definitely book lodging in advance as hotels along the coast can be pricey last minute, especially during holiday weekends as it is a popular getaway for locals from SF and LA (used to be a favorite escape for us when living in the SF Bay area). I’ve been to Hearst Castle twice, and if your wife hasn’t been, always a good tour. Around Christmas, Solvang and Cambria are both really lovely and Solvang in particularly has a nice festive feel (there is a year-round Christmas shop there), especially on weekends. Winter isn’t as a great a time in some of the beach towns where the main activities are outdoors, but you’ll still find plenty to do in towns like Monterey, Carmel, Solvang, Santa Maria, Santa Barbara, etc. If the weather isn’t great, there are always things like the Monterey Aquarium, Missions (Carmel, Santa Barbara), Hearst Castle, breweries/wineries, and lots of shops and art galleries. For something a bit different, you might check out the Pacific Conservatory Theatre schedule as they normally have some programming in Santa Maria (and sometimes in Solvang as well) over the holiday season. A really good local theater company that has loads of notable alumni. Hi, what a complete post about the Pacific Coast Highway road trip! Getting more excite about our trip to California from Spain. We are planning to travel from LA to SF and have 4 nights for our road trip. What do you think we need not to lost ? I have read about Santa Monica, Malibu, Pacific Grove, Big Sur, Carmel, Julia Pfeiffer, Santa Barbara, Monterey, San Luis Obispo, Sta Cruz, Point lobos, MC way falls, Solvang… but we are not sure where to overnight to be able to visit these places. We are leaving Las Vegas on 21st aug and need to be in SF on 25th. If possible would like to visit Venice and or Santa Monica on the 21. No need to visit LA as we will be tbere 2 nightS before on 15 and 16 aug. Many thanks for your recommendations. Sounds like you have a fun California road trip coming up! So on Day 1 you obviously have a long drive from LV to get back to the LA area to start the drive (I’d calculate 5 hours and hope for no traffic jams). I’d head directly to Santa Monica and head north from there. So on Day 1 (21st), I’d visit Santa Monica, Ventura, and Santa Barbara and overnight in Santa Barbara. Day 2 (22) maybe consider overnighting in Morro Bay. Day 3 and 4 (23rd and 24th) – maybe overnight in Monterey or Carmel for 2 nights to explore these towns and do little day trips to see nearby spots. Then the next day head up to SF. If you want any lodging recs for any places, just let me know and happy to suggest some places. Just let me know your preferences and budget. Be sure to check the status of Highway 1 and your route as noted in the post as a portion, particularly around Big Sur, is regularly closed and would require a detour. So just check before heading there to know before you get there to allow more time to go around if needed. Will also take into account your tips re the Highway 1. Yes, unfortunately your dates of travel are going to be some of the most expensive and even normal budget hotels that would normally fall within your range are showing some crazy prices ($400/night) during some of these dates. Its a combination of popular travel time, most people have already booked their lodging, and the fact that there is limited lodging along some sections of the route. I would definitely book all your CA lodging as soon as you can. Hope this helps and wishing you a wonderful trip! Thanks so much for this! Sadly we only have 3 nights, flying in and out of LAX, but we rented a convertible and have a hotel in Pismo Beach the first night… nothing booked yet the next two- not sure if we can see/experience things all the way up to Monterey in only 3 days and back! But this definitely helped! So excited to celebrate our 20th anniversary this way! We had hoped to take this same road trip earlier this year, but our plans changed. After seeing this, I’m glad our plans changed as we would not have seen half of the places that you shared. Thanks for the great ideas – can’t wait to travel the highway! Hi! This is such a great site and what an insightful post! We will be visiting from Asia in July. We will land I San Francisco onjuly 13 and depart from LAX on July 28, so have about two weeks for the trip. I would really like to visit Yosemite but the dates we got for lodging are July 15th and 16th. I would also like to visit Silicon Valley before doing the coastal drive down to LA. Should we then head back to San Francisco from Yosemite or will this be too boring? Also, where should we stop along the coast? We have two young kids! Thank you so much! Hi Jessica, Glad you found our post and blog helpful in planning your California road trip. 2 weeks is a great amount of time to explore some of this region of California. Yosemite is a great place, but if you do that, you’d probably need to leave from SF and then drive the 4 hours for San Francisco and then head back to SF to head south along the coast. I would perhaps save Yosemite for another trip if the 15th and 16th would be your only options or decide it is worth the additional driving off route to you. So it depends on how much you want to visit! Yosemite is a great place although just note the park and the roads around it will be very busy in July and you should book accommodation soon if wanting to overnight there. If you do go, stay for at least 2 nights or you won’t get to really explore much with all the driving time. In terms of Silicon Valley, I lived there for several years, and it is primarily a residential area. It is pretty limited in terms of tourist attractions so I would consider skipping or allotting little time here as there are much better attractions elsewhere in and between SF and LA. A couple of bigger tourist attractions are the Computer History Museum in Mountain View and the Winchester Mystery House in San Jose. If this is your first time visiting California, I would probably allot 3 to 4 days in both San Francisco and Los Angeles as both cities have tons of great attractions, and if you are interested in Disneyland (allot at least 1 full day), it is located just a little south of LA in Anaheim. So I’d see what you want to do at your beginning and ending points and book your accommodation there first. Then see how many days you have for your coastal drive. You’ll likely have 5 to 8 full days left. Any of the California towns and cities we highlight in the article are great for places to stop or stay overnight. With kids, it can be good to overnight places for more than 1 night so there is less moving around and repacking. Since you have two young children, I’d concentrate on places that have attractions you think your kids are going to particularly enjoy, for instance Monterey has a world-class aquarium, Half Moon Bay, Carmel, and Santa Barbara (among others) have nice beaches, San Simeon/Cambria has sea lions to see and Hearst Castle to explore, Solvang has an ostrich farm, horseback riding opportunities, and an easy hike to a local water, Los Osos has opportunities for fun outdoor activities (kayaking, hiking, canoeing), Santa Barbara (and Ventura) offers boat tours and the chance to visit Catalina Island, etc. So I’d read through the highlights mentioned in the article and book stays in the places that sound like ones your family would enjoy. Let us know if you have more questions once you get further along in your planning for your Pacific Coast Highway road trip! Happy to help recommend places to visit or hotels along the route. Wow I just finished reading your tips about planning a California road trip from LA to SF and this is something me and my family would love to do! Your post gave me a lot of tips to plan ahead. Thank you for sharing this information, this is the best I’ve found on this area so far and can tell you lived in California! 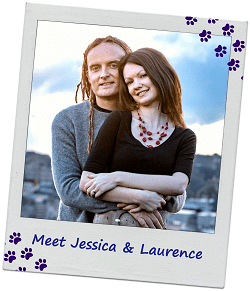 Hi Jessica & Laurence! This is such an amazing & detailed guide about the PCH. I am planning to only drive a section of the route, as I am meeting up with a friend near Cambria, CA – it is my husband and I and our first time there. We will be coming from San Francisco and staying for 2 nights. Do you have any hotel recommendations? Thank you for sharing the post. My husband and I are planning a road trip from SF to LA in 9 days late May. Do mind breaking down an itinerary or days we should spend in each city! Hi Pascale, Glad you enjoyed our Pacific Coast Highway article, and you should be able to use it to figure out your itinerary. In terms of breaking it up by days, it really depends on your interests and if the 9 days also includes times in San Francisco and Los Angeles or not. Assuming it does, I’d probably do 3 days in SF, 3 days in places along the way (perhaps spending the nightmMonterey, Los Osos/Morro Bay and Santa Barbara, and 3 days in Los Angeles. If you are looking for a more detailed day-to-day road trip itinerary with suggestions of where to eat/do/stay, we don’t have one on the blog yet, but we sometimes offer a bespoke itinerary planning service to readers. If interested just email us with what exactly you are wanting and we can let you know what we can offer and the cost, etc. Hope this helps and wishing you a great trip! Beautiful photos! You particularly made me excited to visit Cambria and Monterey! I just live in Costa Mesa so all these places are just a drive away. Thanks again for sharing! The pacific coast highway is a great idea for a California road trip, I will surely try that one with my friends. I’m going to save this article for our guide. Will surely go each place you feature here. It was truly stunning. Very sound advice and helpful information for driving the Pacific Coast Highway and how to build an itinerary. This post gives everything one needs for a successful roadtrip in California. Nice pictures too! I’m trying to plan a trip for myself to San Luis Obispo and Sonoma in mid-January. I want to see the Hearst Castle and visit any other notable sites in SLO. I have friends in Sonoma and basically want to chill out there. I’m not a drinker, so a wine tour probably wouldn’t work. I would like to end up in L.A.. I am coming alone, am 70 yrs. old, healthy and want to stay in decent, but not prohibitively expensive apartments. I will clearly need a tour operator at the Castle.. I will have about a week. I have been to Calif. several times, but never to these areas. 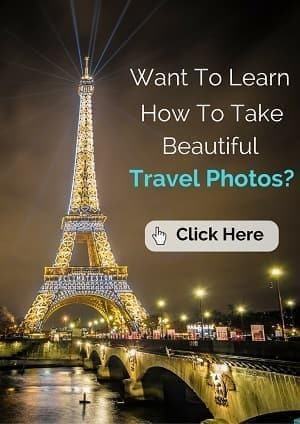 Any advice about a reputable tour company that I can pick up either in SF or L.A.? This is hard to research on Trip Advisor.Thank you. Sounds like you have a fun trip to California planned. For SLO, you can see most of the sites within the city by walking, using a local bus, or taxi. Now for Hearst Castle, it is actually about an hour drive away in San Simeon but you can actually take buses all the way to the Hearst Castle Info Center from SLO and back if you wish. I’d book your Hearst Castle tickets in advance though as they sometimes sell out in advance, and you can read more about our visits to Hearst Castle. You could also book a private driver or tour company, but I don’t know of any tour companies that offer a tour from SLO to Hearst Castle. But Viator for example offers tours that include Hearst Castle and some start/end in Los Angeles or San Francisco that may be a good fit. I don’t know of any tours that would include all the places you want as they are quite far from each other, and most tours are going to include a lot of other stops that may not be a good fit (e.g., lots of wineries). But I would take a look at the Viator options above and see if any of those work as some of them do include San Francisco, Hearst Castle, and Los Angeles. They may also be able to put together a private tour since you know what you want. Also you could get to all the places via bus/train if you wish and not do any tours. Sorry I can’t give you a good tour company recommendation as since we lived there, I didn’t do any tours there. For apartments, I’d check out Airbnb and VRBO as my first choices, but here is a list of apartment booking websites you can check out. Thanks so much for this detailed breakdown of your drive from San Fran to L.A.
My Boyfriend and I are flying into San Fran a week Fri (Sept 29), staying until Monday and are planning on renting a car and driving Hwy 1 ( I believe this is the scenic route). Some of the Hwy is closed near Big Sur so I was just curious as to how far it is to get from Hwy 1 to 101 and if we will have to back track if we stay in Carmel of Big Sur. We are thinking of staying in Santa Barbara on the Wednesday night and driving to L.A the next day and exploring L.A for the day but I am not sure where we should stay and what to do Monday, Tuesday and in and around Santa Barbara on Wednesday. I wish we had more time but we have a wedding and family to get to in Granada Hills and Newport Beach so we need to be in Granada Hills Thursday eve. We are both in our mid-30’s, haven’t done this drive before so we are super excited! I have no idea what we would explore around these places. Also, not sure how the weather will be in October. Would it be chilly if we wanted to go to the beach? One other thing I thought i should mention is the aquarium sounded really nice on your list. I do love California wine so it would be neat to stay at a winery along the way close to our accommodations. ???? Yes, you don’t have a lot of time so I would be sure to check the latest road closures news concerning the Big Sur area (and any other closures along the route). A detour can cost you several hours of time in backtracking and getting to the 101 depending on where the closure is located. I would suggest overnighting in Monterey or Carmel and then if there is a closure, skip Big Sur and head from there to the 101 to bypass the closure and Big Sur and rejoin Highway 1 at Cambria (you can then drive up Highway 1 backtrack north a bit to visit San Simeon and Ragged Point if you want). A drive from Monterey to Cambria via 101 is about 3 hours and is actually the quickest way to get there (not via Highway 1 which can be slow moving). Then you should be able to stay on the Pacific Coast Highway – Highway 1 the rest of your time until Los Angeles. In terms of what to do, I’d check out suggestions in the post above for each of the towns/cities you want to visit. The aquarium I mentioned is in Monterey and is a great stop, one of the best aquariums I have visited. Nearby are loads of shops and restaurants along Cannery Row. You might want to do the 17 mile drive at nearby Pebble Beach, there are great restaurants in this area, and the beaches around Carmel are nice. 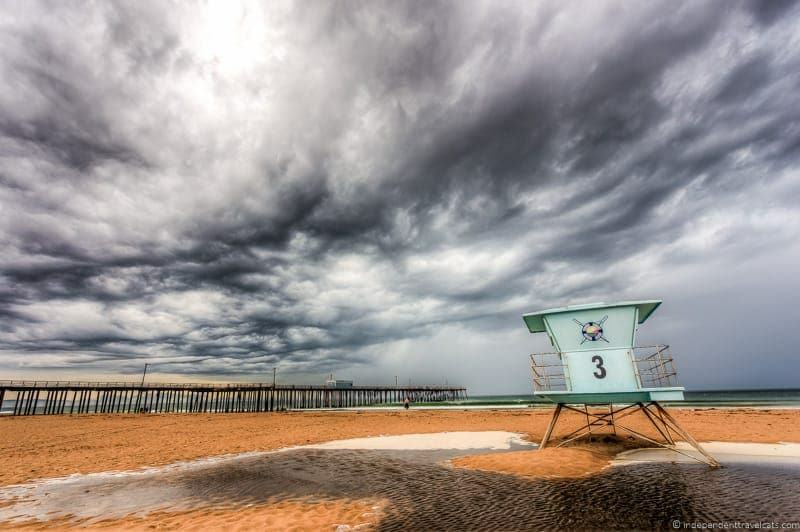 The water will be chilly so dress appropriate with layers and bring raingear – you’ll likely be wanting to walk not swim on these beaches (once you reach LA beaches will be warmer and you could swim there). You can check out our post on our favorite spots around Cambria, one includes a winery and there is a wine trail in this area. There are also wineries around Monterey (Folktale Winery have taken over the former Chateau Julien vineyard and I think they offer tastings) and Santa Barbara that are easy to visit. Hope this information helps and wishing you a great trip along the Pacific Coast Highway!! I just will have 1 day to travel from Los Angeles to san Francisco . I would love to take the pacific coast highway. but I’m afraid how long this trip will take, I don’t want to arrive late to san Francisco. What would you recommend me. Wow. Literally JUST watched you guys on House Hunters on HGTV! Surreal. Thanks for the detailed breakdown of the PCH. It’s a last minute trip I’m planning (literally planning to leave in two days) so the info is quite helpful. I’ll give it a go and let you know how your suggestions pan out! Hello and thank you for this helpful article! I am trying to plan a trip this October to fly into SF and go a little north and then back south. We only have nine full days plus 2 days to travel each way.I’ve been reading a lot and using California vacation guide, trip advisor, blogs but still can’t come up with a plan! It will be our first time doing a road trip in California. My priorities are The Big Sur area (pch) seeing Redwoods, Napa or Sonoma, Monterey Aquarium, and a couple spots in SF. Originally I thought I wanted to start at the northern border and drive all the way to LA or San Diego but realize I can’t do everything I want within that time frame. I had really wanted to see Glass Beach in Fort Bragg and the Humboldt Redwood SP but I know I can see redwoods near SF at Muir Woods and big basin. So I’m not sure it’s worth driving all the way to glass beach then turning around to go south. I’ve read mixed reviews of the amount of glass left. So in a nutshell, I need help with itinerary and a friend at work that used to live in Sacramento recommended I don’t make hotel reservations and just wing it because I don’t know how long I will want to stay in each place but I’m kind of afraid to do that. Hi Amy & Mike, Sounds like you have a lot of things you want to see and not a whole lot of time. I would definitely not recommend driving the full length of California as it would not give you any time to really explore any one place. I’d advise spending more time at fewer places rather than trying to see too much and rush from place to place. Days 1-3: If you have never been to San Francisco before, I would spend at least 3 full days in the city as there are so many things to do there and it is a great place where you can walk and take public transit without having to worry about a car. Days 4-5: Then rent a car and head north to either Napa or Sonoma for 2 relaxed days for wine tasting, vineyards, scenery, and good food. Day 6: You can then drive south down to the Highway 1 (PCH), perhaps making a short stop in pretty Half Moon Bay to check out the town and beaches and then carry on for a stop at Big Basin Redwoods State Park for a hike (a favorite place of mine for hiking, California’s first state park actually). However, I would avoid Half Moon Bay and any roads near it if the annual pumpkin festival is taking place during the dates of your visit as traffic will be a nightmare in that area. Day 7: Then the next day you can continue your drive along the PCH heading to Monterey (perhaps stop at Half Moon Bay, then visit the Monterey Aquarium) and spend a full day there are a number of other things to do in both Monterey and nearby Carmel such as the 17 Mile drive, shopping, good seafood restaurants, missions, and beaches. Day 8: Then the next day you can spend just driving the Pacific Coastal Highway via Big Sur, stopping as you like (so many great potential stops along the way), and perhaps spend the night in Cambria or San Luis Obispo (or Santa Barbara) depending on how far you want to drive and how much you want to stop. Day 9: Then spend the next day driving from wherever you stopped and head further south to Los Angeles, stopping along the way. Then you can drop off your car and fly out of Los Angeles (or San Luis Obispo, Santa Barbara or Long Beach which all have smaller airports). Obviously LAX is a super busy airport and traffic near L.A. can be terrible so if you do decide to leave out of Los Angeles leave plenty of time. Alternatively if you want to fly in and out of SF to save money on flights and/or rental car, I would only head south as far as say Ragged Point or Cambria, then drive back towards SF to leave from the SF airport (it is about equal distance to either LA or SF from Cambria). In October you should be OK not booking ahead for accommodation if you’re flexible with lodging and cost, but if you know where you want to stay each night I would advise booking ahead so you don’t have to worry about it and get the kind of lodging you want. There is not much lodging around the Big Sur area in particular and prices can be quite high in both San Francisco and Napa/Sonoma year round and in any cities or towns where they are having a festival so it is good to try to book in advance and get deals online if you can. These are of course only my recommendations, but I hope they are helpful in making more solid plans for your trip to California! Please feel free to ask any additional questions and have a wonderful vacation! I also found your itinerary very helpful. My husband & I are planning our first roadtrip on PCH for 12-14 days Oct 7-21 for our 5yr Anniv. Either starting in San Fran or L.A or San Diego. There’s a concert at Hollywood Bowl I’m considering that would be the 10th, that’s why I thought to use 2 nights S.F & 2 nights Hollywood/L.A area. So far highlights I’ve pinned are as follows, please provide any suggestions of what to omit or for sure add & how our time should be spent on each area. ~To L.A- Stop Laguna on way, then Sunset Blvd, Rodeo Dr, Griffith Observatory, 2 nights stay, any suggestions? ~Heading North – stop at Malibu, El Matador State Beach, Ventura, then over-night in Santa Barbara? ~ In this area I also want to see SLO, Spooners Cove, Morro Bay so would you suggest I overnight in SLO or Morro? 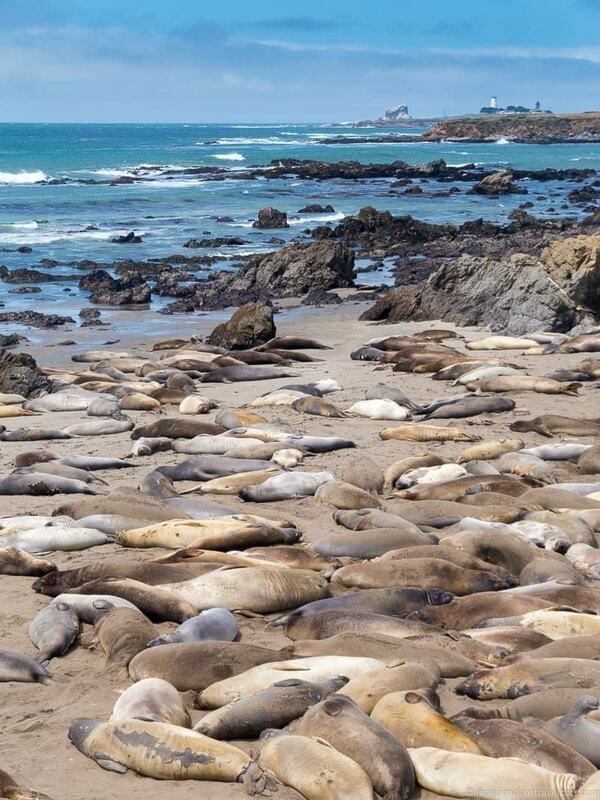 ~ Next to Cambria, San Simeon, Hearst, Elephant Seals. Then overnight at Eli Colibri in Cambria like you, San Simeon Pines Seaside Resort or anywhere on Moonstone/San Simeon. ~ Next to Big Sur. Pfeiffer Beach, Nepenthe, McWay Falls, Hiking, Andrew Molera State Park, I would like to stay in Big Sur as well for a night with a view. Open to cabins/camping with tent provided. ~ Next to Carmel. Rocky Ridge Trail, China Cove, Point Lobos State Reserve, Carmel River State Beach, any drives to take that get up in the highlands in this area? 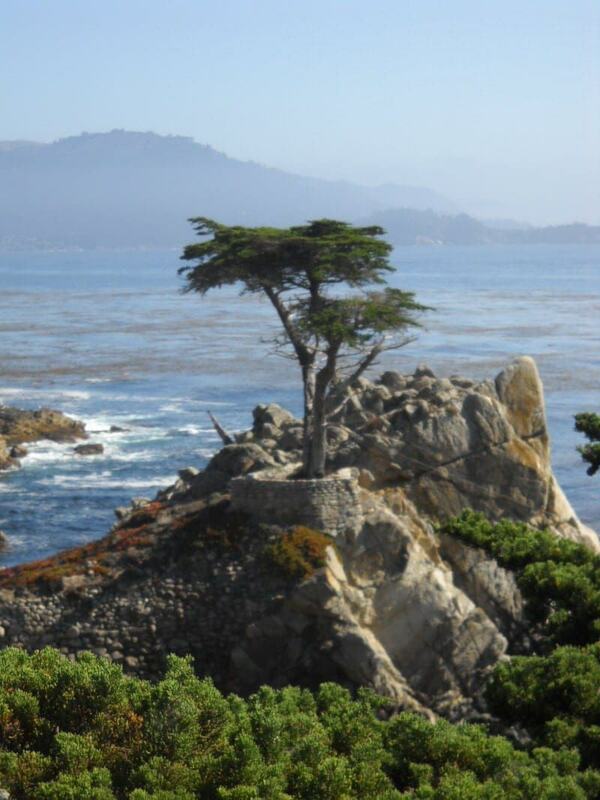 Would like to overnight in Carmel by the Sea, maybe Cypress Inn or B&B/Boutique Hotel. One of Napa or Sonoma shorter winery visit in beautiful surroundings? Suggestions? Golden Gate Park, Painted Ladies, Lombard Street, Pier 39, Ferry Bldg Market Place, China Town, Nob Hill, Union Sq., Fisherman’s Wharf, South of Market, Twin Peaks. Still need suggestions on accommodation in SF. Any help you can provide on my itinerary will be greatly appreciated! Thank you! We couldn’t even book a campsite in Yosemite Valley so had to opt for a place in Groveland. No worries, however, as we will be mobile. We will be staying for 2 full days at Yosemite. From SF it looks like Higway 120 will be the best bet in getting to Yosemite. I took your advice and emailed Los Padres NFS and we’ll see what they tell me. I’ll be sure to pass that information on to you later. By far the most helpful, logical and easy to process information about the PCH that I have found so far. I have TONS of websites and blogs bookmarked and I always find myself returning here. My wife and I (I’m a Canadian teaching History in Seoul, Korea and my wife is a Korean teacher) are doing the PCH this summer from Aug 9th to 21st and after reading your blog we booked ourselves a JUCY Champ. We’ll rent in SF and drop off in LA for a one way fee. I also read your extensive review about your experience with JUCY and that was a major decision making factor for us. Thanks for that. I don’t have too many questions but I guess where to camp would be a key one. I looked at the Los Padres NF website and there seems to be a lot of campgrounds but where they are exactly in relation to the coastal road/towns is a bit of a concern. Any info on that? Also we will drive to Yosemite from SF for a night and two days prior to the PCH drive; any info on routes? Again, thanks for the helpful information. Keep it up! Hi Mike, Thanks so much for your nice comments! 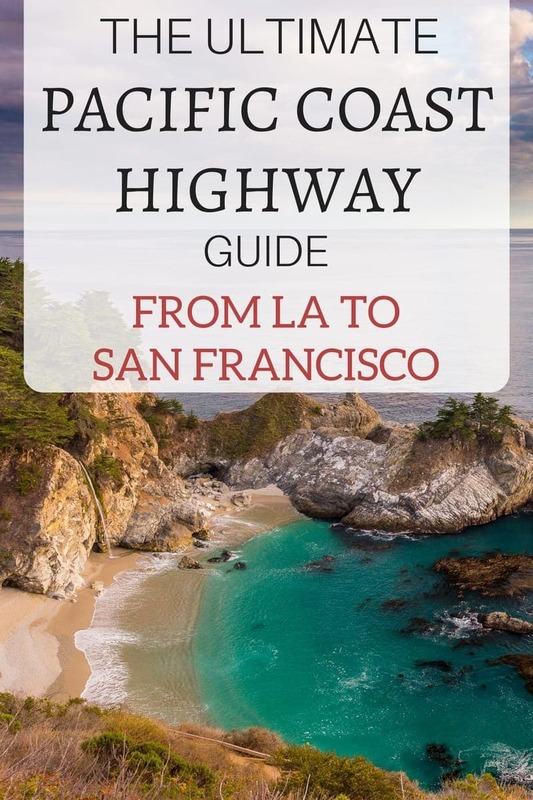 I did try to write a pretty comprehensive and practical guide to the Pacific Coast Highway – I think it helps that I lived in the SF area for several years and visited many of those places multiple times. That sounds like a very exciting trip and it is great that you have about 2 weeks to explore which gives you plenty of time to stop and visit several of the towns and cities in California. I am also happy you booked a JUCY Champ – a fun (if slightly cramped) experience! Definitely saved us a lot of money on lodging and food. In regards to campsites, there are so many of them within Los Padres National Forest, some are just off Highway 1/PCH and some are quite a long drive. I would perhaps email or call the main office for Los Padres (I think each country/district has its own office) saying you will be driving along the coast and which campsites are the closest to the road. You can probably also go to the website and google map them although this could take a bit of time as there are a lot of them. I’ll be doing this trip in May and I was also planning to rent a Jucy. Do you have any good recommendations on where to park each night along this trek? I’m a little confused and overwhelmed by all the campground options! I’m thrilled to have found your blog; your trip is nearly identical to what mine will be! This is on our bucket list to do someday.. great post capturing all the wonderful spots along the California coast! This I wanna do!! Thanks so much for all the input. Jessica, What a lot of details! I love the California coast. It certainly ranks up there as one of the Great American Roadtrips! This post is amazing! Your list of potential stops is right on. I still have to explore the area north of San Francisco. I did the Carmel part of this a few years ago and was just blown away by the views. I’ve always wanted to go back. Thanks for the tour of the full PCH! Carmel is one of my favorite seaside city getaways. It is more expensive than a lot of other coastal cities, but it is really charming and pretty. Hope you get a chance to return and visit more of the coastal cities. That campervan is one of the smallest I’ve seen. It’s probably an advantage to not be too big driving along the PCH. We drove from LA all the way up to Portland when I was a kid, and it is still one of my standout childhood travel memories. I myself have driven between LA and Santa Barbara many times but need to make that trip all the way up San Francisco again. Your photo of Point Reyes looks gorgeous. I’d love to visit both that and Hearst Castle. I really enjoyed reading about your road trip! We did the LA to San Fran drive several years ago – and though ours was interrupted by a road wash-out and detour mid-drive, it was still one of the most beautiful road trips I’ve been on. Point Reyes is one of my all time favorite spots int he US – and windiest too! – and I had never seen anything like the Elephant Seal Rookery before in my life (I’m originally from the Midwest). Thanks for taking me along – I think it’s time to do this one again soon! The elephant seals near San Simeon are the best! That’s my favorite part of the California coastal drive. Yes, the elephant seals are amazing, although they are not always on the beach in such great quantities depending on their seasonal life cycle. I have been there three times, two times there were thousands of them but on our last visit this summer there were only about 20. Beaches and waterfalls are so interesting. I would love to visit such places in California one day. Thank you for sharing! Oh my word, the PCH is so beautiful. Your photographs are stunning. There are many places I haven’t been. 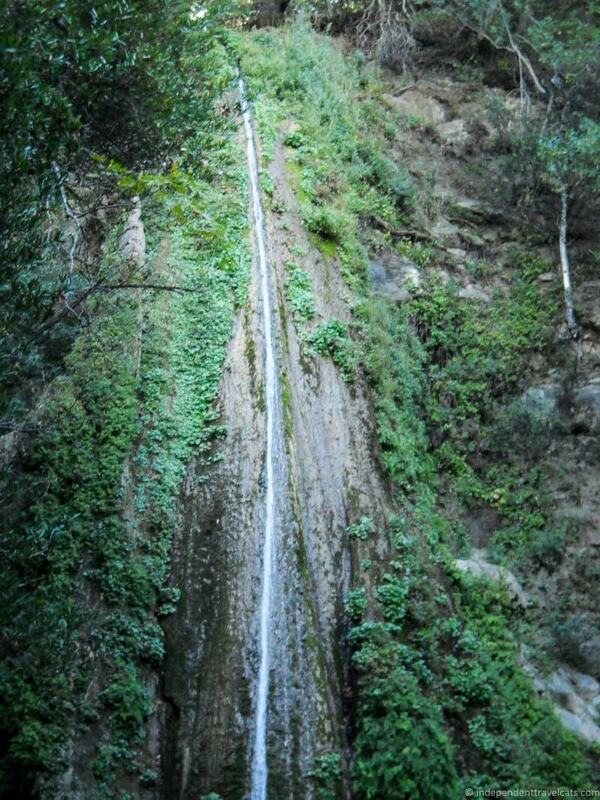 I would love to see that waterfall at Solvang! Hi Seana, Yes, it is a really beautiful driving along the California coast. 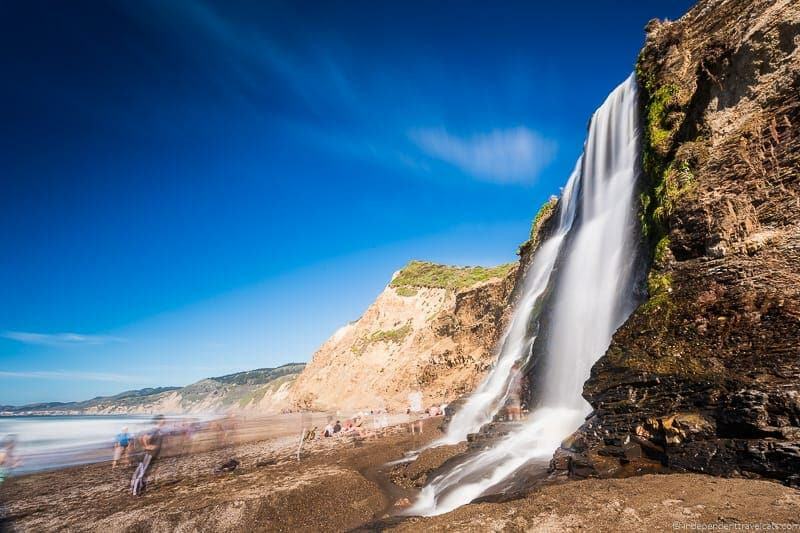 Definitely recommend this drive if you have a week or two vacation:) Yes, there are a few great waterfalls along this route, some of our faves were McWay Falls in the Big Sur area, Nojoqui Falls in Solvang, and Alamere Falls at Point Reyes.